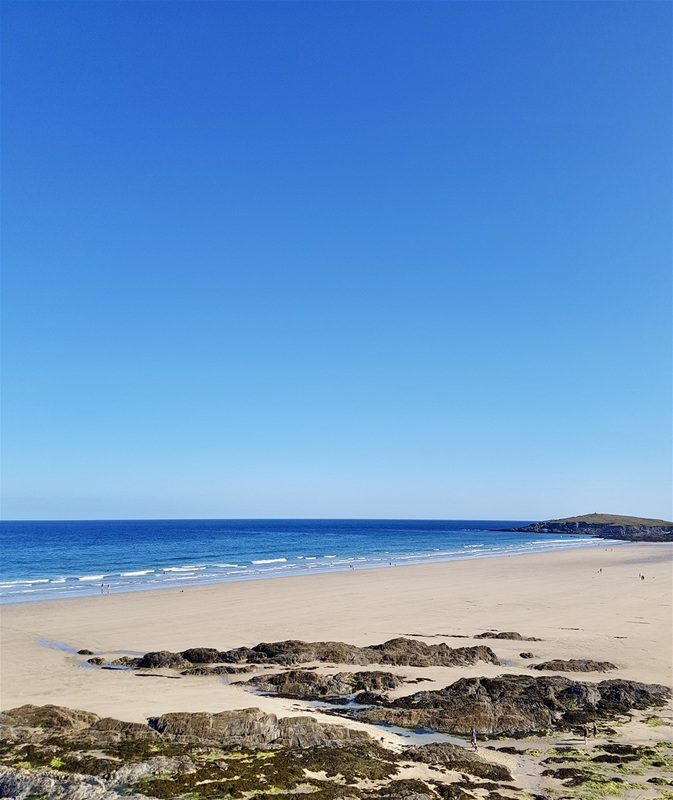 Fistral Beach, Newquay at six o’clock in the morning. Still not quite deserted. We were inundated with emails the other day, from all over the world, acclaiming our blog’s achievement at reaching the dizzy heights of twenty-five thousand unique followers. Shamefully, neither of us had noticed! 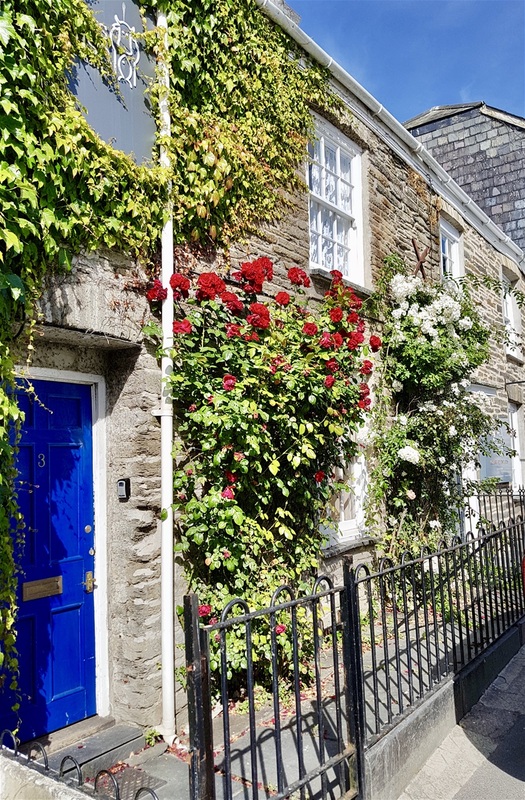 Mostly photographs today, taken from all over Cornwall as we’ve been driving down the narrow lanes, walking on beaches and cliff tops and taking advantage of some glorious weather to explore what is surely England’s most photogenic county. 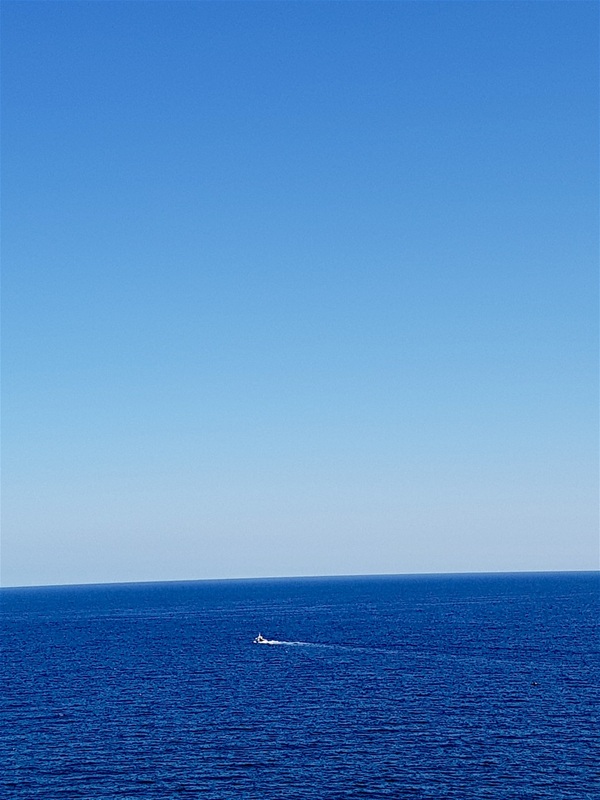 This blog post is a melange of several days out in this spell of delightfully warm weather. 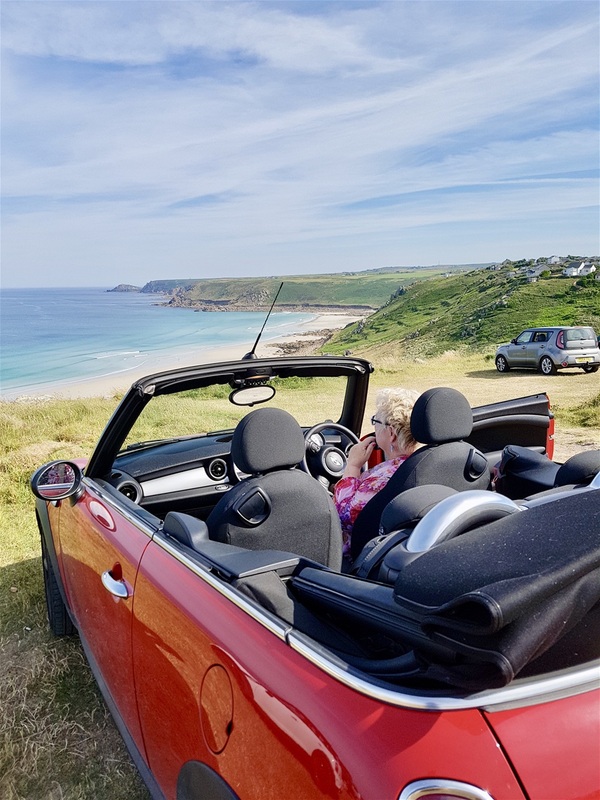 A Mini Convertible is the perfect antidote to those feelings of ennui that creep up on one when the weather is hot and Ruby has taken us far and wide in the last week or so. 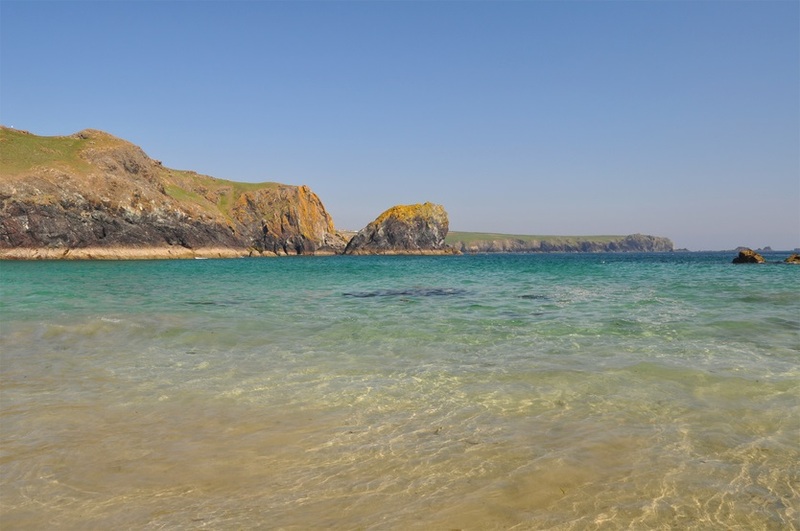 Cornwall is a big place, long and narrow, with the longest coastline in Great Britain. 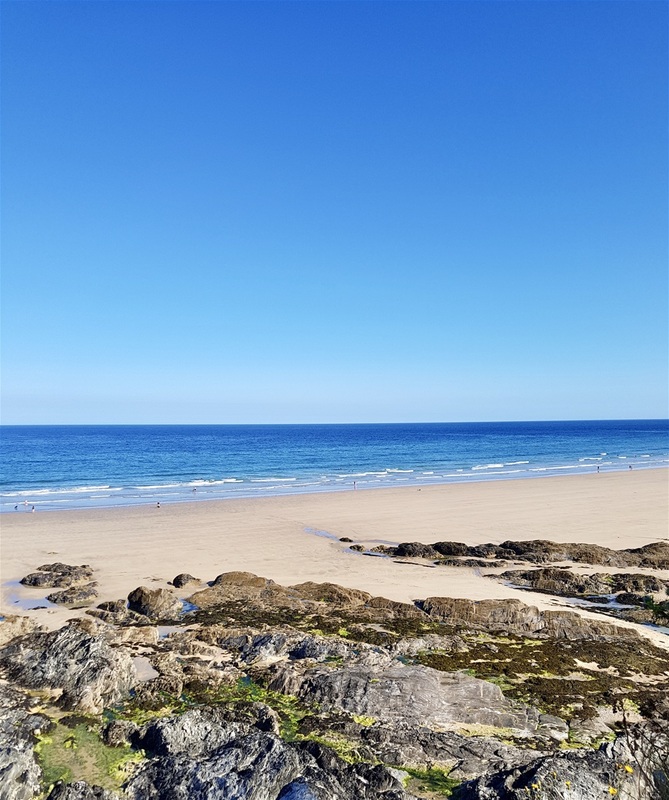 A lot of coastline means a lot of beaches and we’ve walked on beaches in the past few days that are equal to any we’ve seen anywhere in the world and we’ve been almost everywhere! 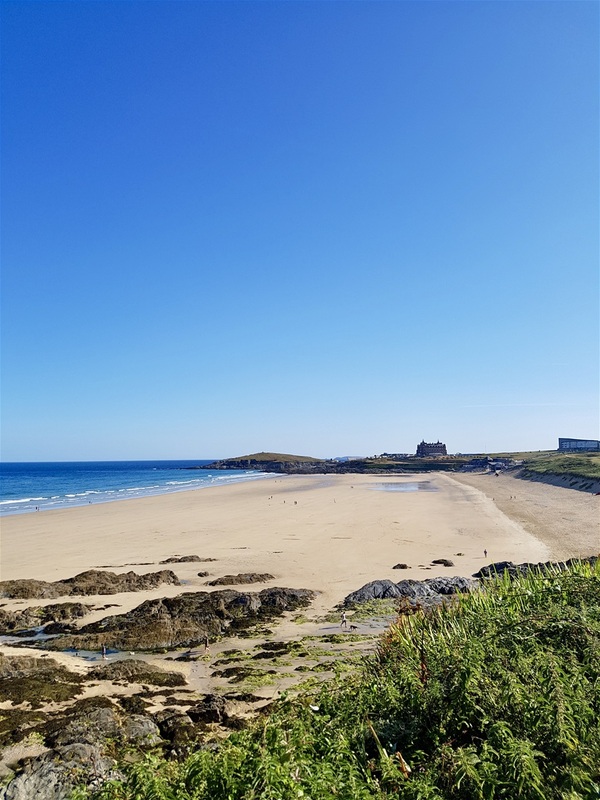 Blue sky and sunshine help, of course, but golden sand and a turquoise sea are an irresistible combination. 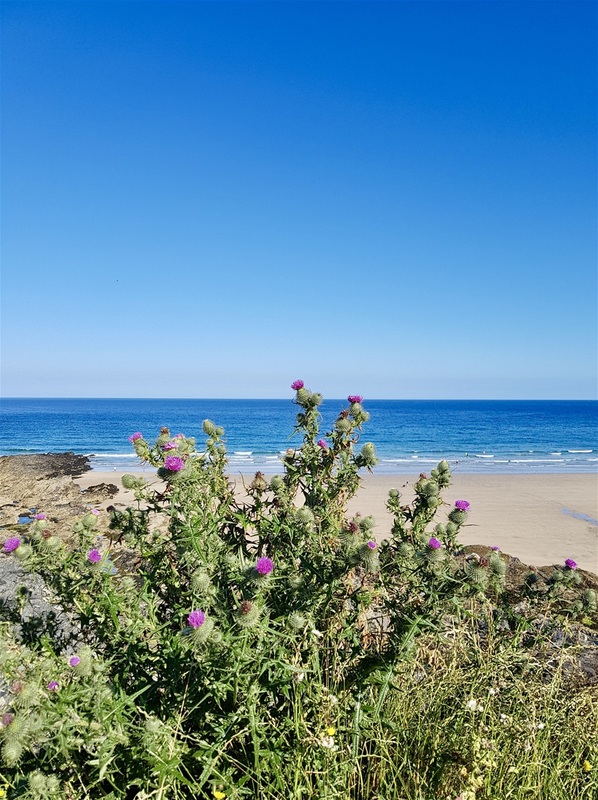 Cornwall, or Kernow as the locals call it, is one of the seven historic Celtic Nations – the other six being Alba (Scotland), Eire (Ireland), Breizh (Brittany), Mann (Isle of Man) Cymru (Wales) and Gallaeciea (Galicia, in Spain). Not a dud among them! 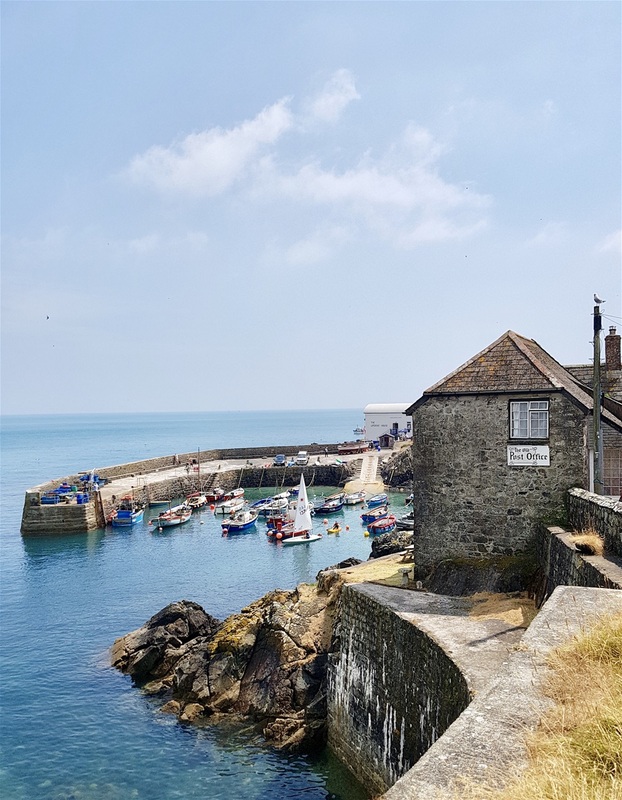 Poldark is back, so there’s fresh interest in Cornwall this summer and the remnants of the tin mining industry are doing brisk business with tourists. 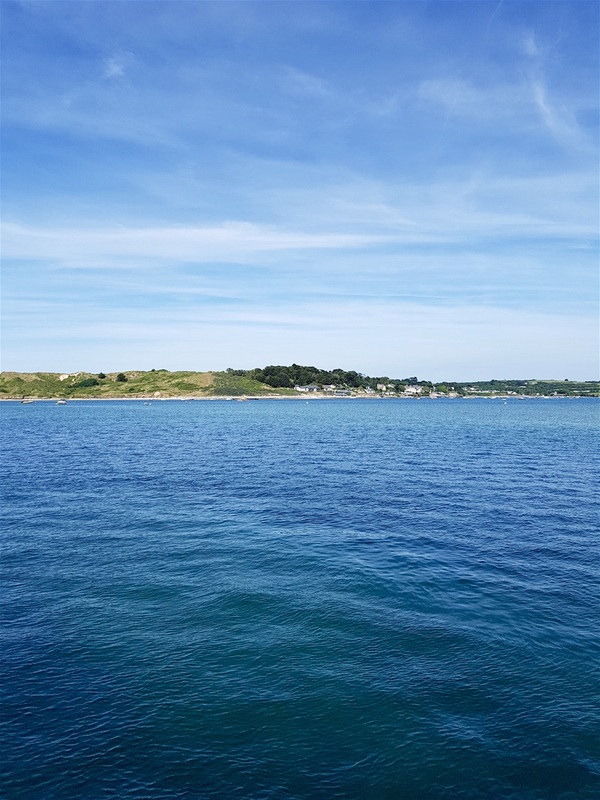 In the 1900s, half of the world’s tin came from Cornwall. 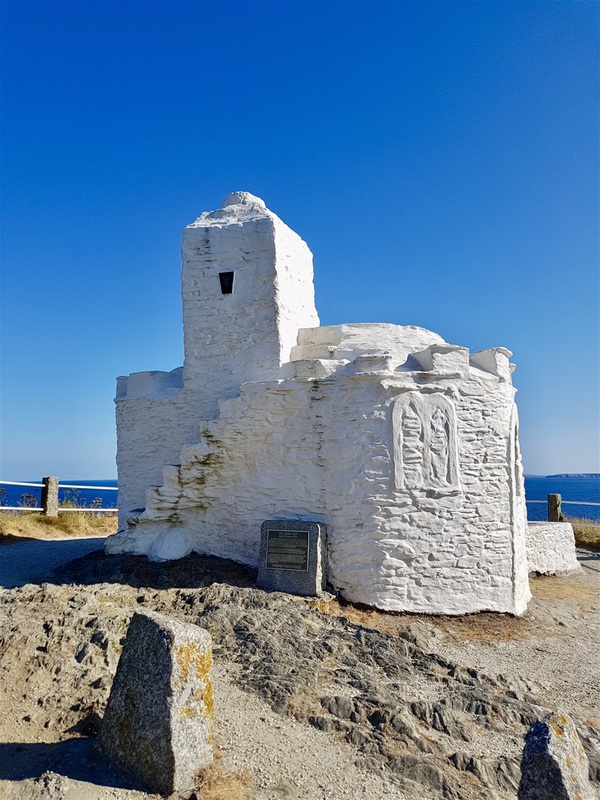 The tin miners of Cornwall once traded with the Phoenicians and at this time Cornwall was known as The Cassiterides or The Tin Islands. 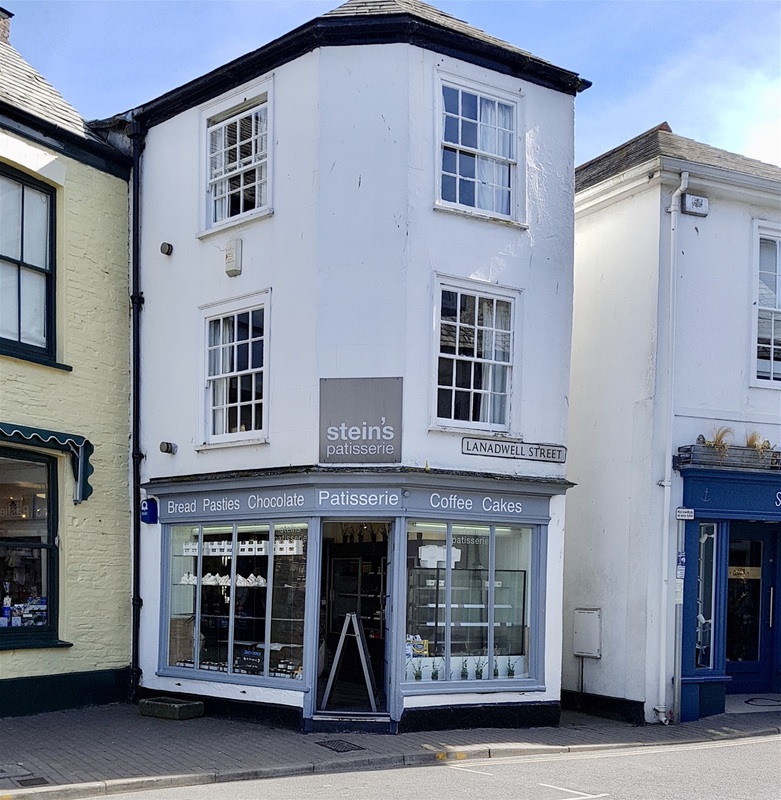 Later on Cornwall became known as The Stannaries – stannum being the Latin word for tin. (If I recall my school chemistry lessons correctly, the symbol for the chemical element tin is Sn). 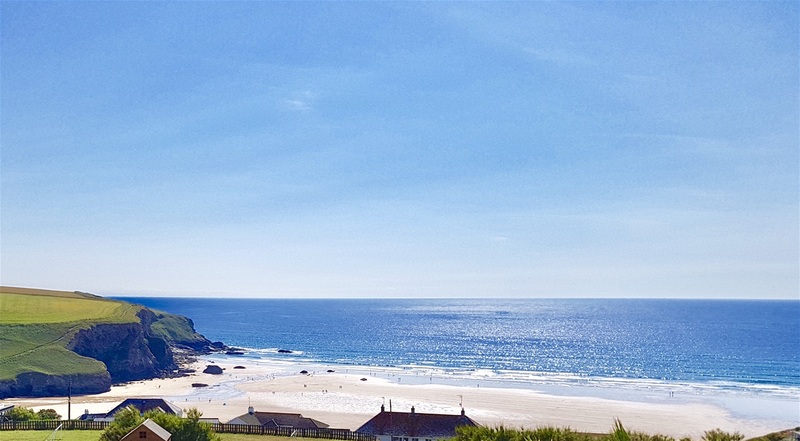 Cornwall has about half a million permanent residents, but more than five million tourists a year. 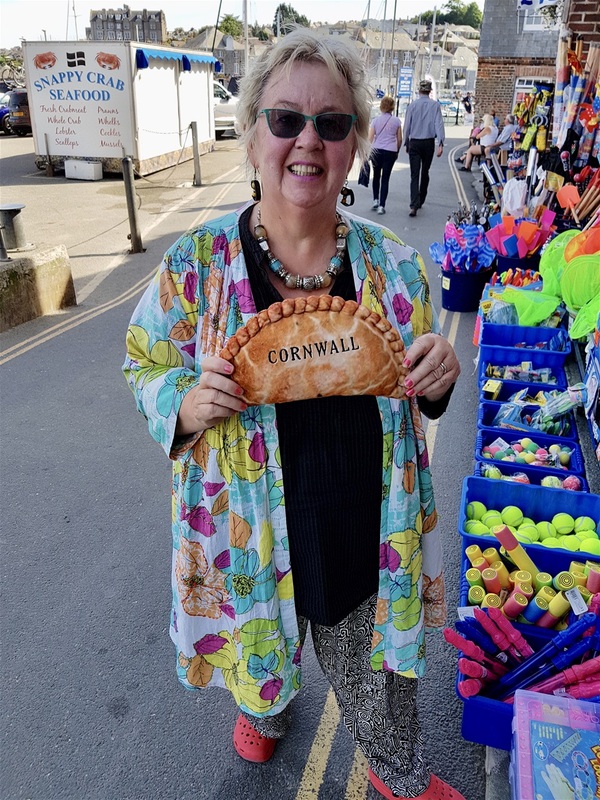 Those tourists eat more than 5 million Cornish pasties every year, an average of 13,500 a day. 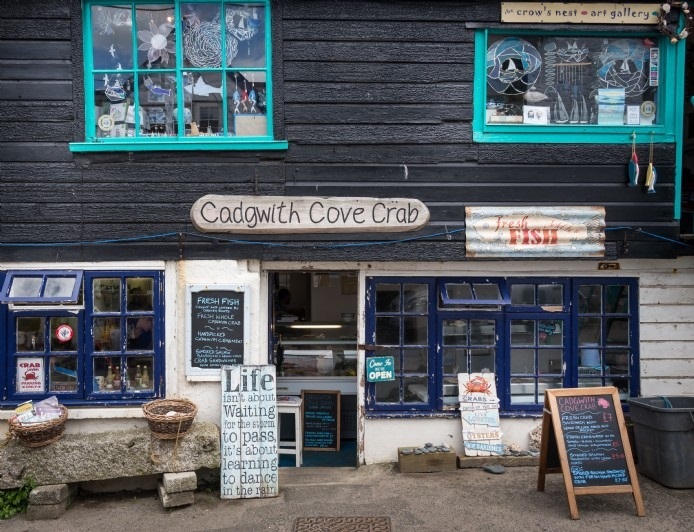 No wonder the humble Cornish Pasty is worth £150 million a year to the Cornish economy. 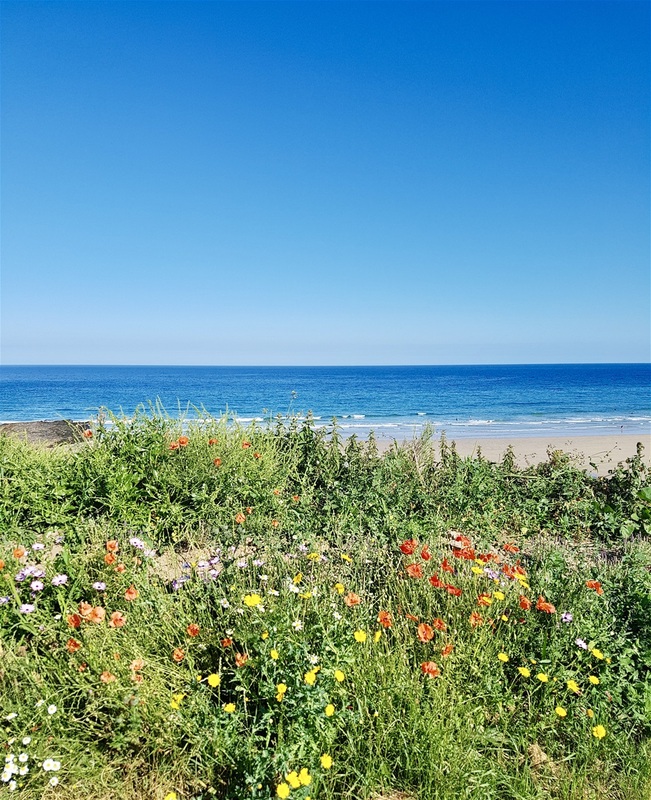 We love Cornwall and have done ever since our first long stay visit in the late 1960s when Marigold worked in a boutique and I delivered custom built surfboards all over Cornwall. 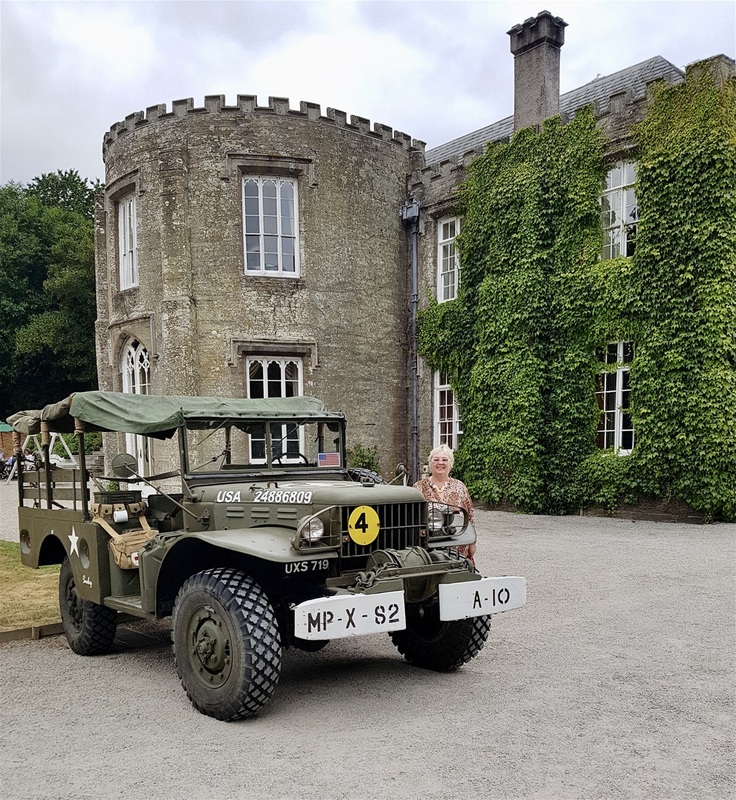 We lived in a very small tent, stored our meagre belongings in the back of our Austin A35 van, and our friends were itinerant surfers from Australia, New Zealand and California. These days, we don’t ‘rough it’ to the same extent, but otherwise little has changed. 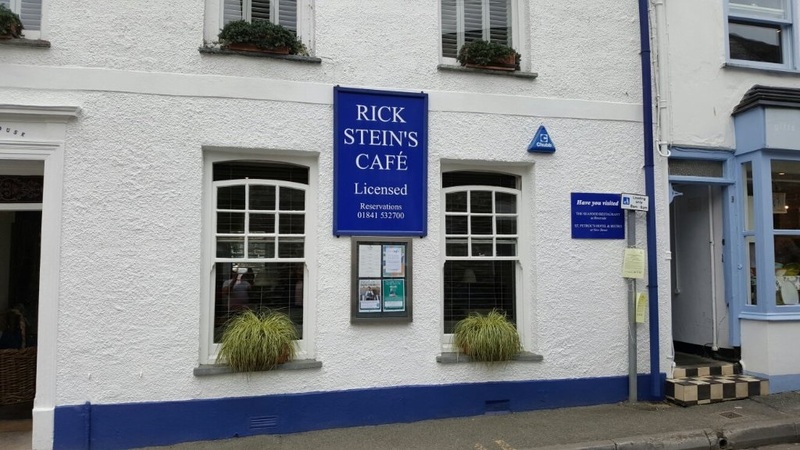 Visiting Padstow means going either early or late as the association with Rick Stein put Padstow on the map and now means this tiny fishing village is over run with visitors. We arrived in early evening and wandered around for an hour or so. 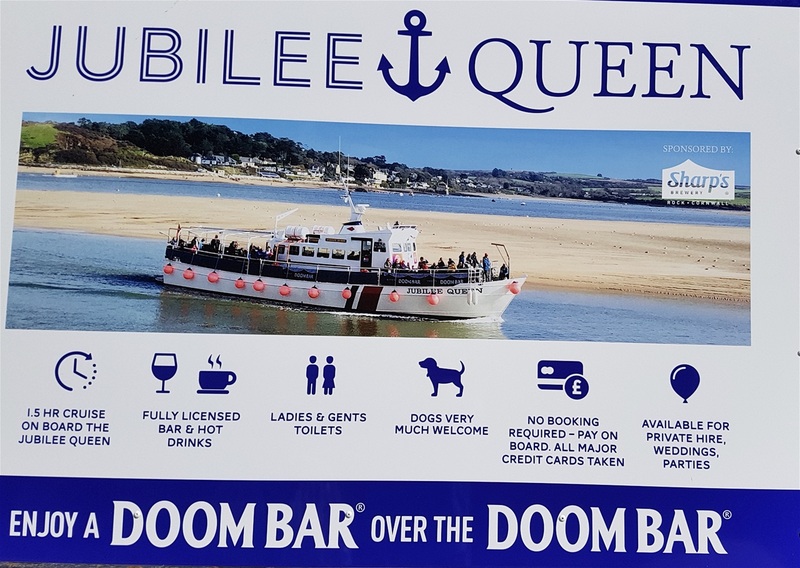 We could have taken a trip around the bay, a ferry to Rock just over the way or a boat trip to visit the notorious Doom Bar. 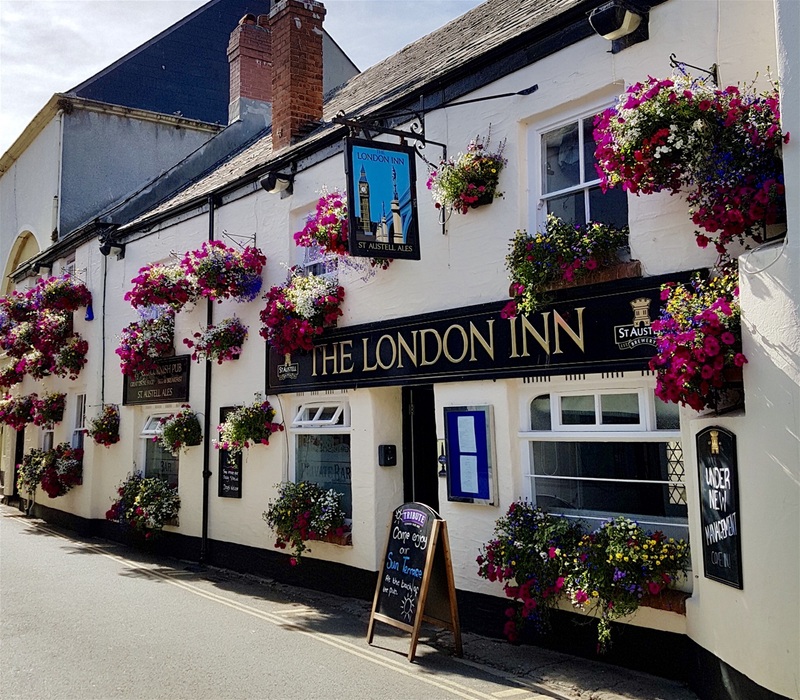 Widely known as the brand name of the most popular beer in England, the flagship ale of the local Sharp's Brewery, the Doom Bar is a bank of sand at the estuary of the River Camel where it meets the Celtic Sea. It can be seen at low tide and appears innocuous enough, but many ships have been wrecked there. Doom Bar dates back to the reign of Henry VIII and 60 percent of the sand is composed of crushed shells, making it an important source of agricultural lime, which has been collected for hundreds of years; an estimated 10 million tons of sand or more has been removed from the estuary since the early nineteenth century, mainly by dredging. 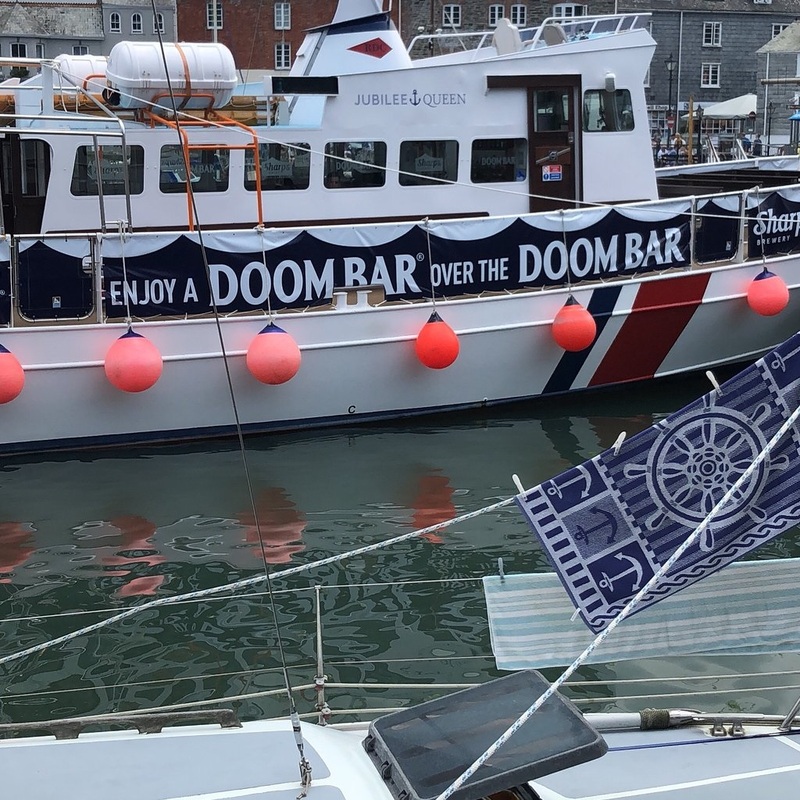 This evening we were invited to drink a Doom Bar over the Doom Bar by the crew of one of the many boats plying for custom. 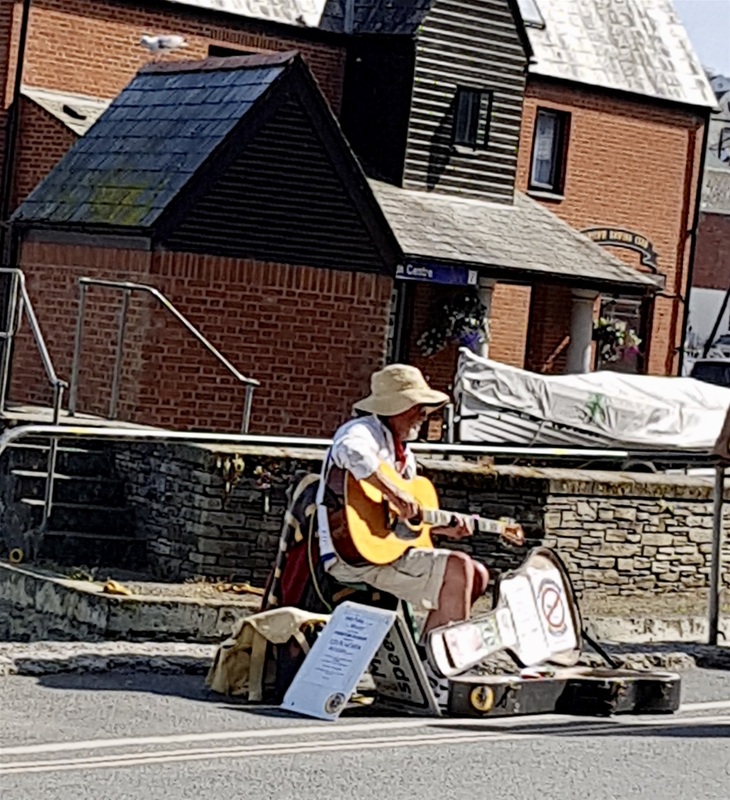 The only cash we parted with went to a longtime Padstow ‘attraction,’ a busker who has been playing his guitar and singing on the quay for many years. Buskers divide opinion, but we’ve seen a fair few very talented performers in our time and at least they offer more than a beggar with his hand out. As we sat on a bench, people watching, a dog came and sat right next to Marigold. 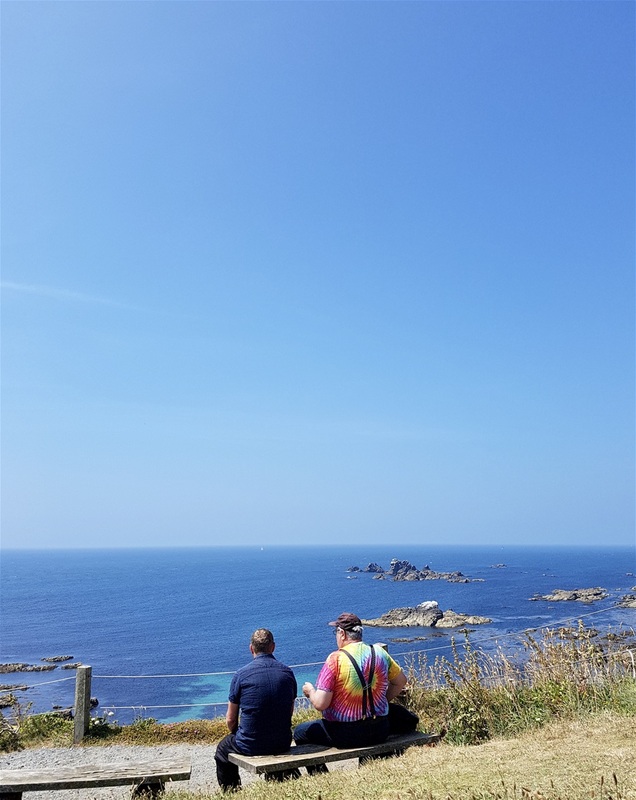 We’ve met up with a two year old Newfoundland, two Saint Bernards, and a Dogue de Bordeaux on our recent travels. All of them eat and (possibly) weigh more than the average human. 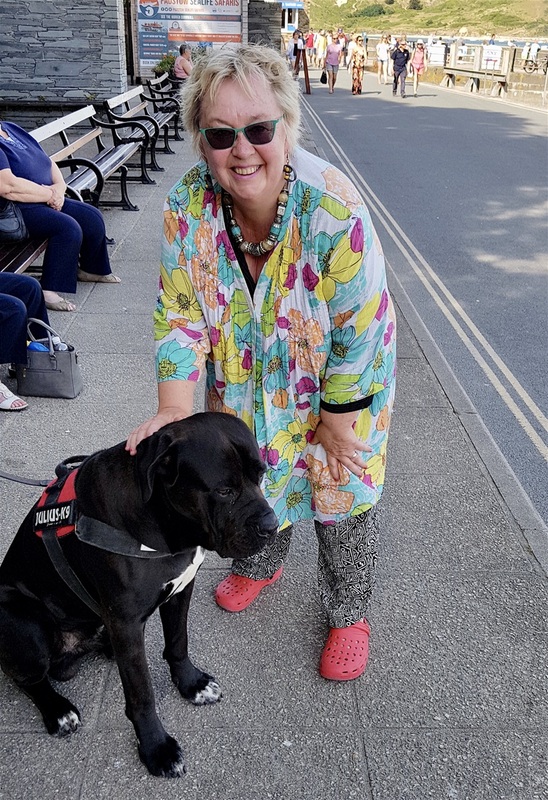 Today’s offering, on the quay at Padstow, was not in the big dog league for height and weight, but was certainly impressive. Dogs like me, I must smell like one, but Marigold is wary of those big enough to devour her in a single bite! 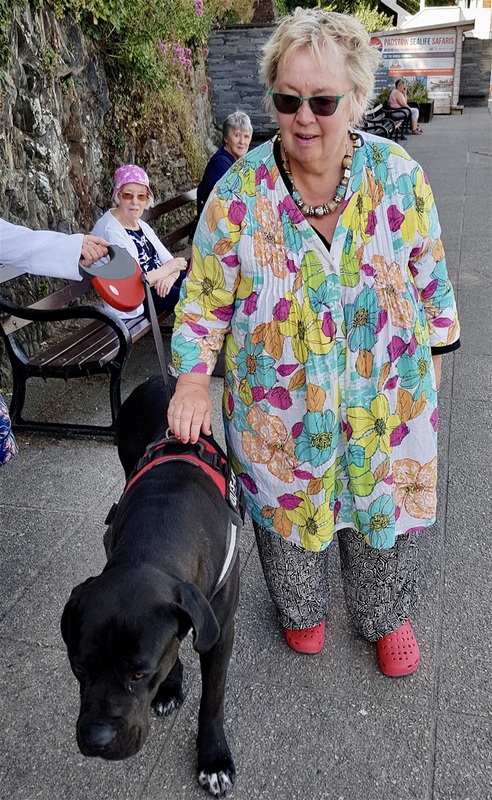 The owner told us her dog was a Cane Corso - also known as Italian Mastiff – thought to be descendants of the Roman Molosser dogs. Molossers were used to subdue wild boar, wolves and other predators in farming communities, but are best known for being used as attack dogs alongside infantry in Roman Legions. This one is not yet fully grown and turned out to be a playful puppy, albeit a very large one. 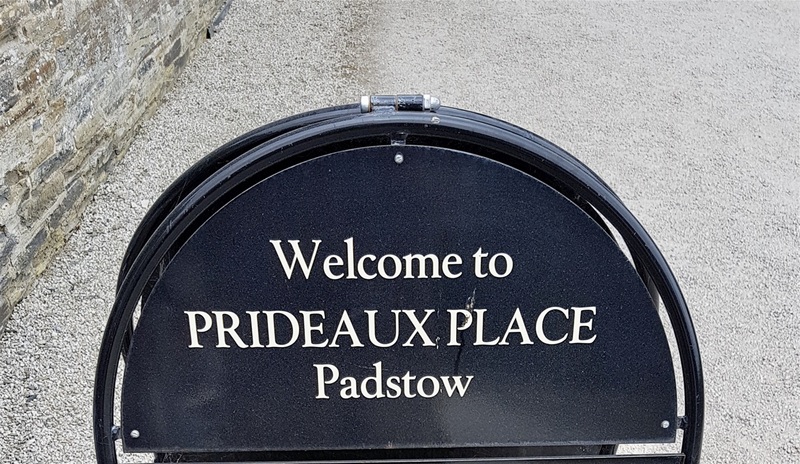 On our way out of Padstow, we drove through an ornate entrance gateway and discovered Prideaux Place, an Elizabethan Manor House, completed in 1592 by Sir Nicholas Prideaux and, over four hundred years later, still owned and lived in by members of the same family. 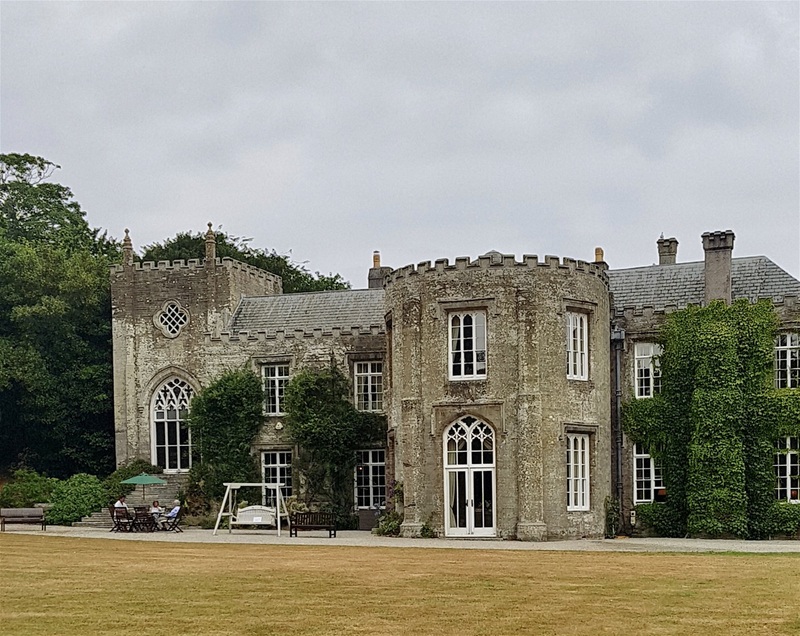 We didn’t go inside or opt for a guided tour as it was far too nice a day to go traipsing round an old house, admiring portraits of long since departed ancestors. The grounds are superb, an extensive deer park especially, but the sight of a dozen ‘detectorists’ demanded our attention. 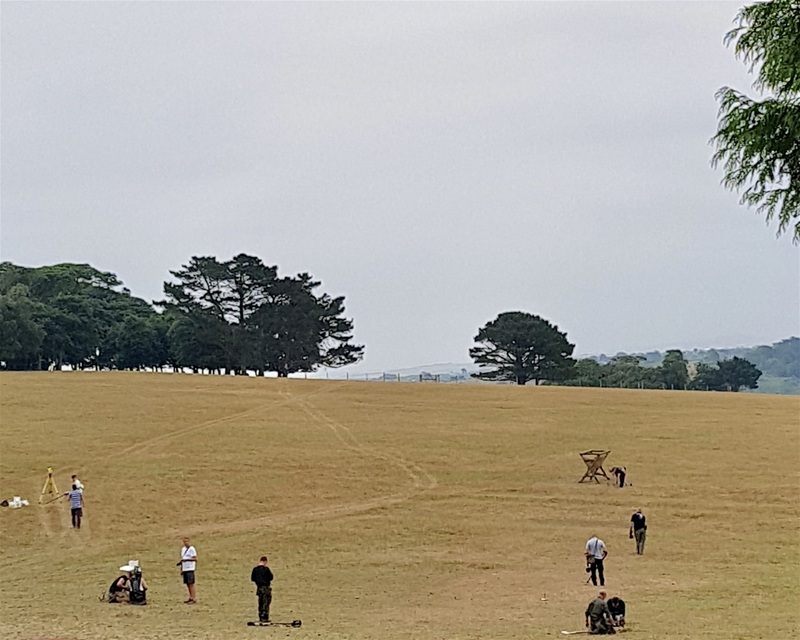 Metal detector wielding enthusiasts were hard at work covering every inch of ground in search of buried artefacts. We watched for a while, but nobody uttered any shrieks of excitement as they unearthed a Saxon horde of precious metals so we gave up and left them to it. 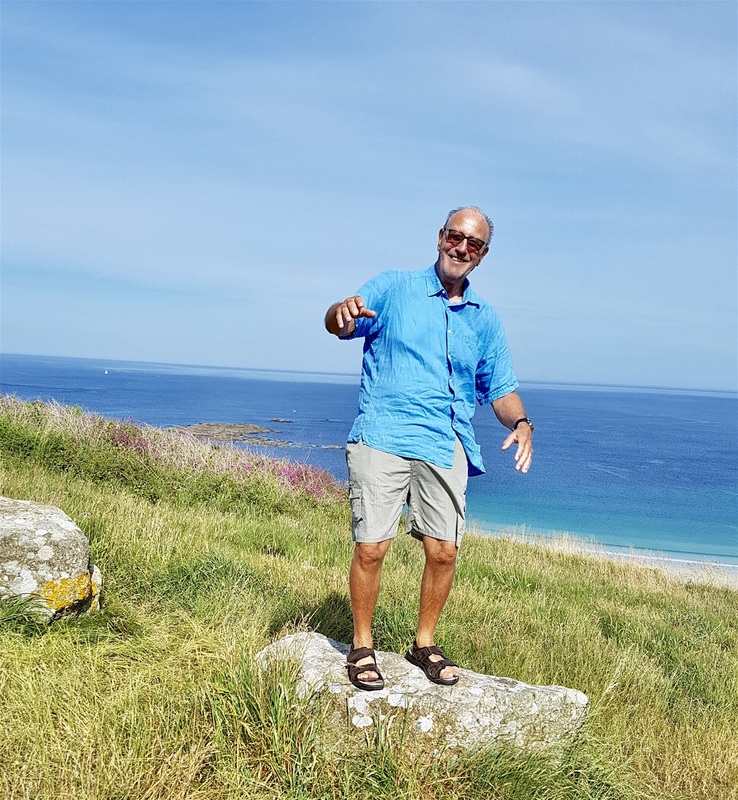 Not been to the far tip of Cornwall for a while, so we decided to pay a visit. 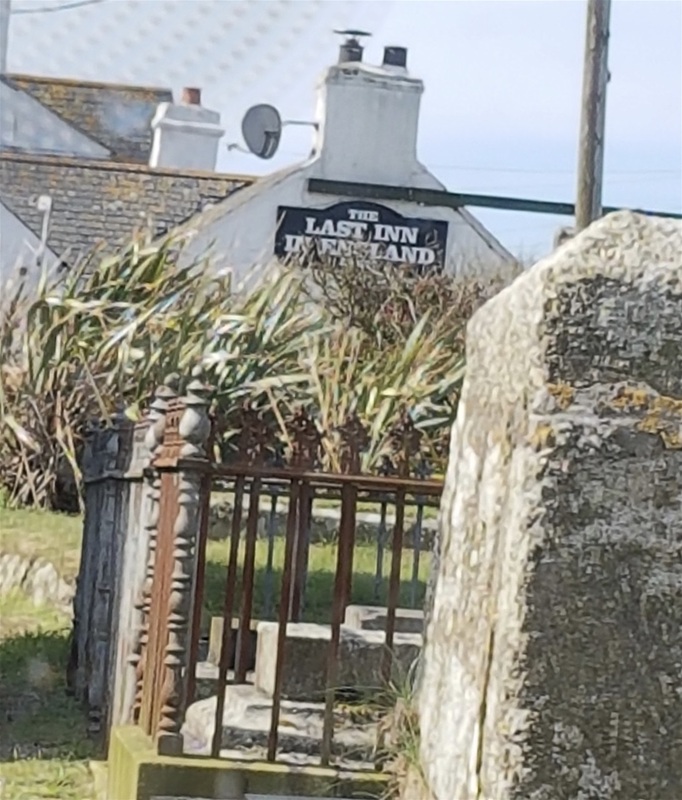 No, not Lands End which would be an over-commercialised waste of our time. 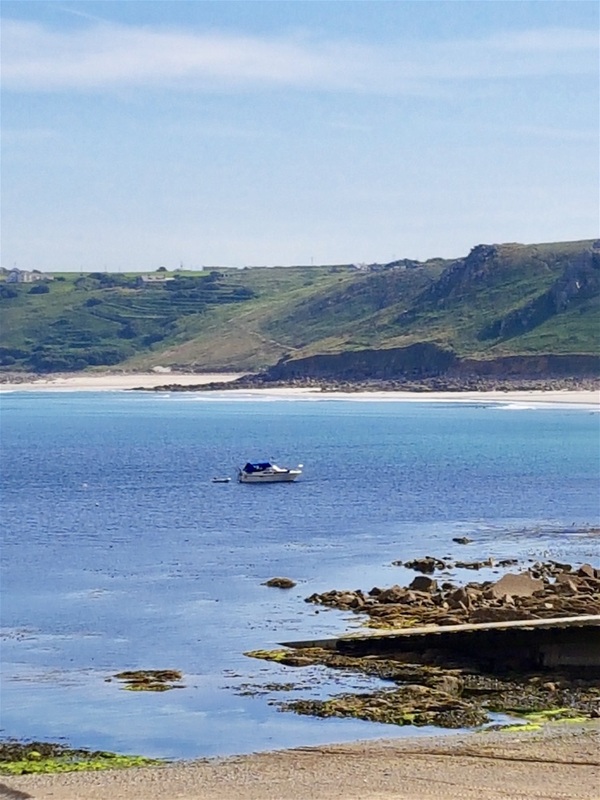 We drove there, just in case it’s improved, past the First and Last pub in England- depending which way you’re heading – and could see at a glance it’s just a second rate theme park so we went to Sennon Cove instead. Many years ago I remember this being one of the best places for surfing and there were surfers here aplenty today, all with glum faces as the strong wind was blowing straight out to sea and the waves were almost non existent. 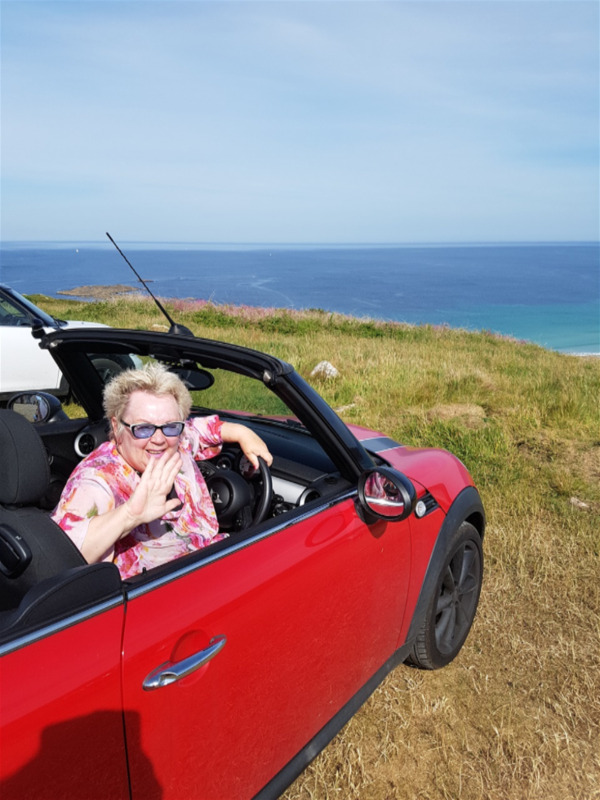 Marigold drove Ruby onto the cliffs, stopping a very long way from the edge, and we were lucky enough to see not one but four Cornish choughs, battling against the wind practically at eye level. 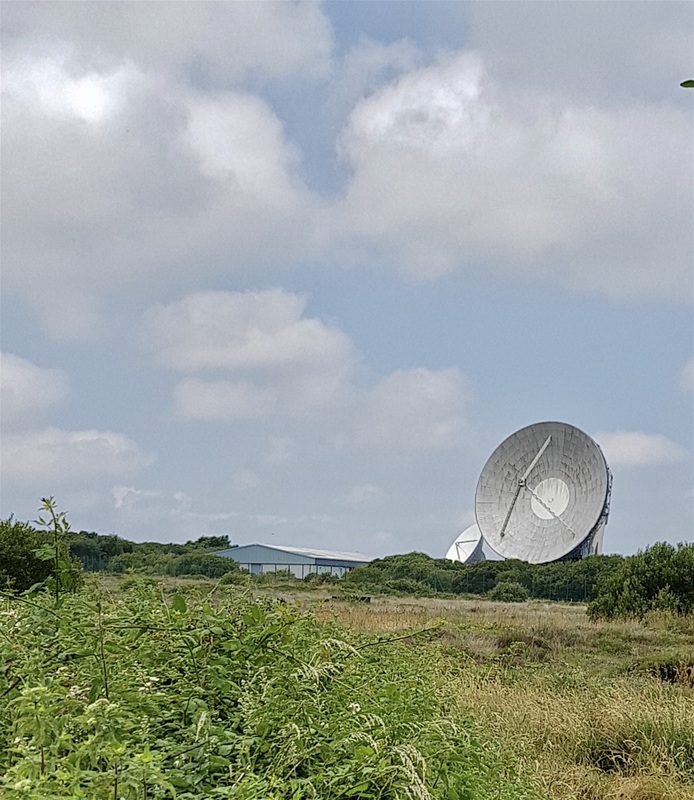 We went to look at, if not actually explore as security is understandably tight, the Goonhilly complex near Helston; the site of the world’s first first parabolic satellite antenna. 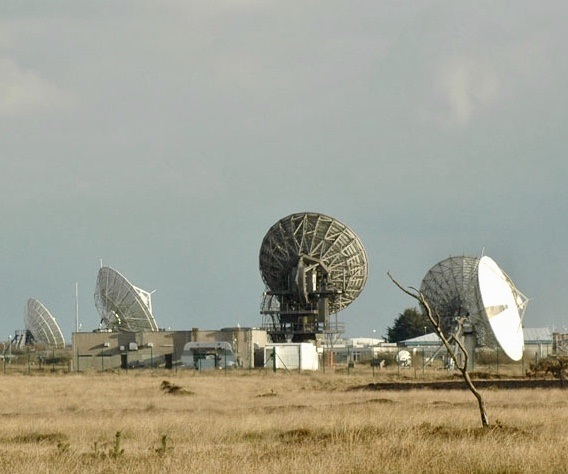 That disc, installed in 1962 and named ‘Arthur’, was built to monitor the ground breaking Telstar satellite and handled the first ever ‘live’ TV broadcast via satellite. 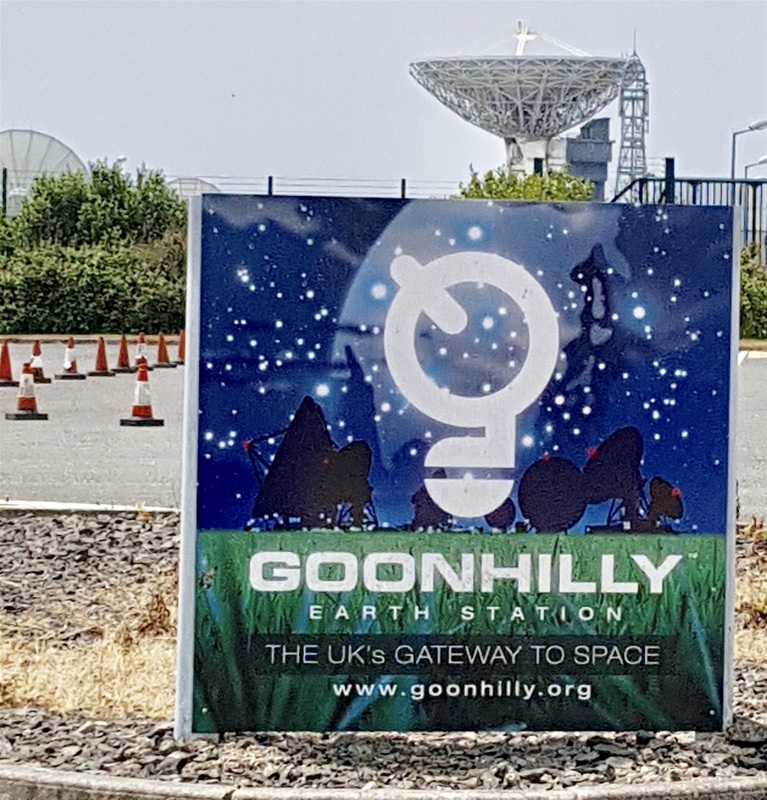 At one time the Goonhilly station was the largest of its kind on the planet with more than 60 dishes and it’s still an impressive sight. That first transmission using Telstar to bounce a tv signal around the curvature of the Earth transmitted its first image - a video of a wind blown flag outside a TV station in Andover, Maine - on July 11, 1962, but it was the historic broadcast 13 days later that captivated my teenage imagination. The Telstar satellite relayed the first ever live transatlantic broadcast. Walter Cronkite and Chet Huntley - newscasters on rival TV stations - and the BBC’s Richard Dimbleby hosted the show. The program started with a picture of the Statue of Liberty and the Eiffel Tower side by side, each coming from different sides of the world. I can remember the quality being far from perfect, a fuzzy picture and a noticeable time lag, but everyone was talking about it for days afterwards. Now, we take this technology for granted, but back in 1962 this was truly astonishing and only the televised pictures of a Moon landing seven years later was deemed sufficiently remarkable to beat it. 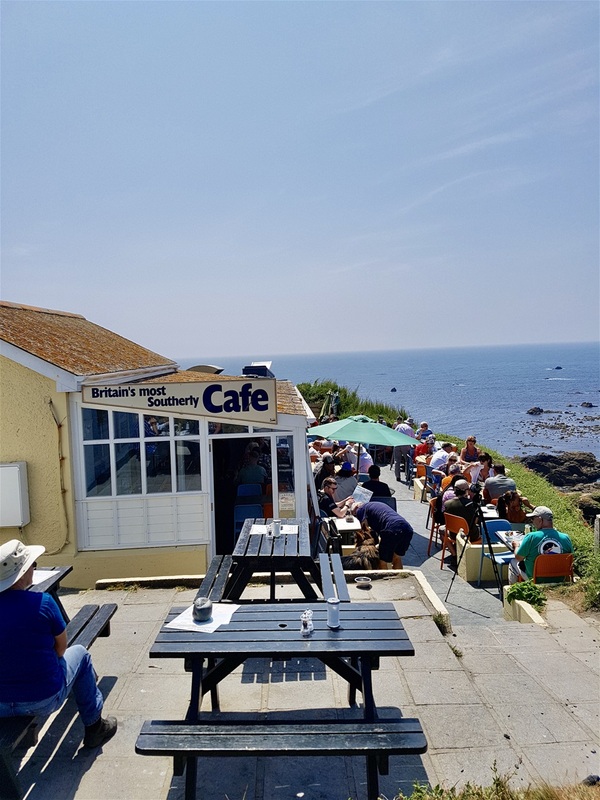 Next stop was Lizard Point, complete with the Last Café in England. 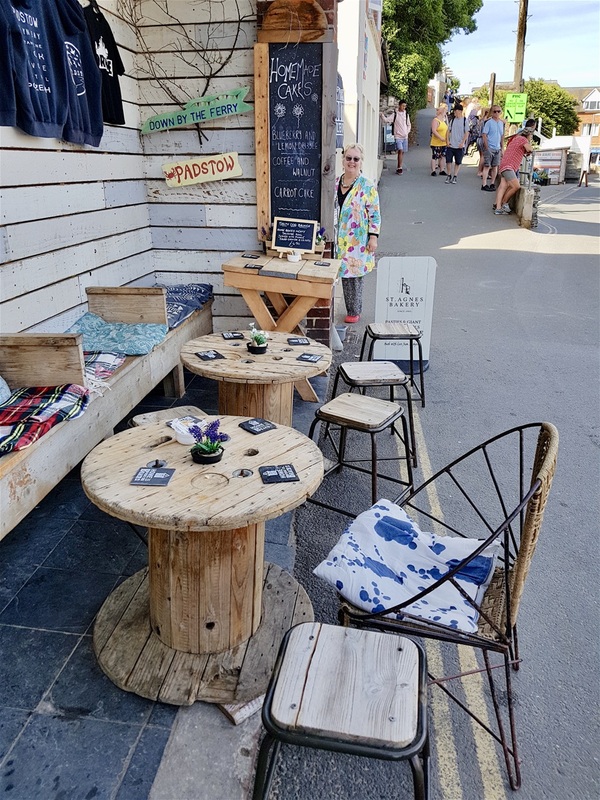 There’s no ‘first café’ this time as the café is perched on the actual furthest point so to claim it as the ‘first’ would only be appropriate if approached from the sea. 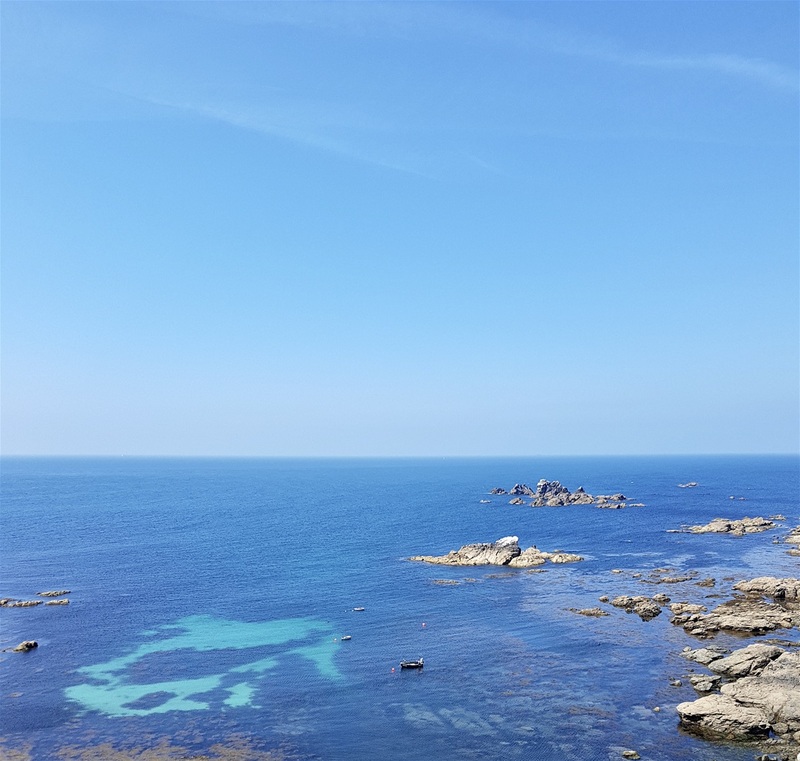 The rocky coast of Cornwall has been the scene of many shipwrecks and Lizard Point was the scene of the greatest ever sea rescue by the RNLI. 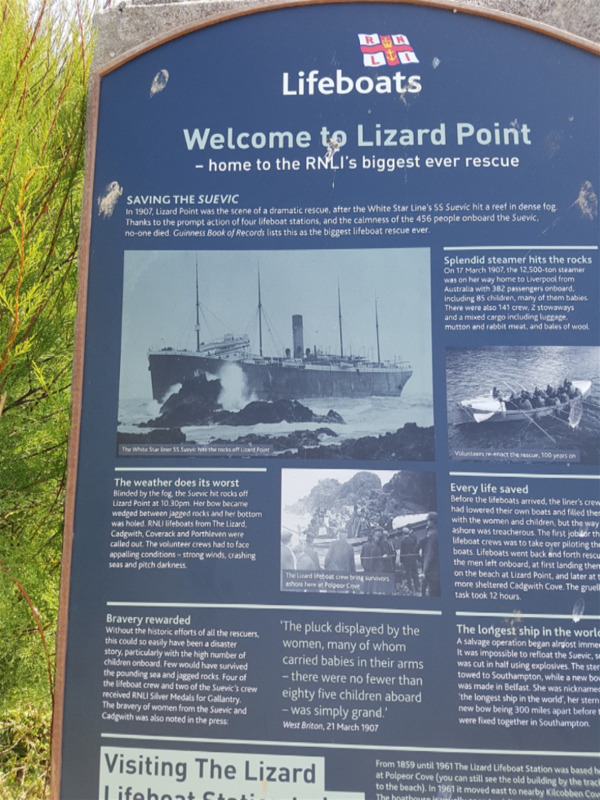 There’s a plaque commemorating the rescue of all the 456 passengers from The Sueric which ran ground on rocks while sailing from Australia to Liverpool in March 1907. 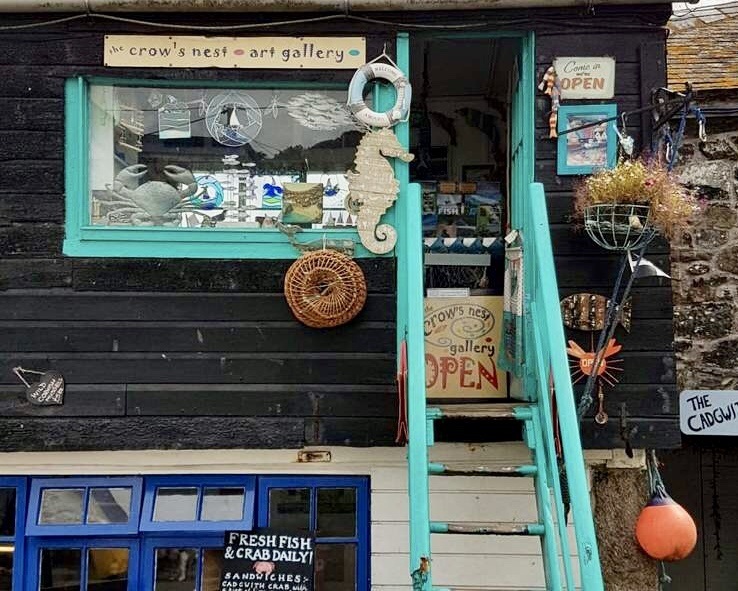 Sixty volunteer crewmen from Cadgwith, Coverack, The Lizard and Porthleven rowed back and forth for 16 hours to rescue the passengers, battling huge waves and ferocious winds in open boats and saved 456 lives, including the 70 babies onboard, without a single life being lost. Reading this account, we felt humbled beyond belief at the heroism of those volunteer lifeboat crews. We chatted to a couple of well equipped hikers, with all the correct gear, who looked exhausted. Marigold asked how far they’d walked today and the lady walker looked a little surprised. ‘We’ve just got here,’ she said, ‘not even started yet,’ indicating their car parked right next to ours. 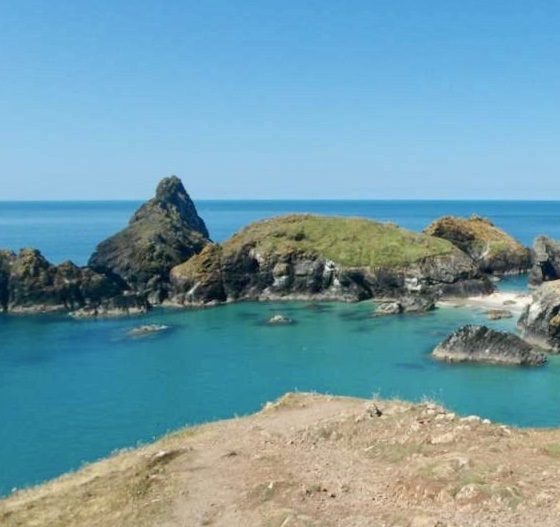 We told them we were intending to go to Kynance Cove next and they told us it costs £5 at the National Trust car park, then a long hike, twenty minutes for ‘walkers,’ so that’s half an hour for us, before reaching sea level. Yes, of course they are. We’re not. 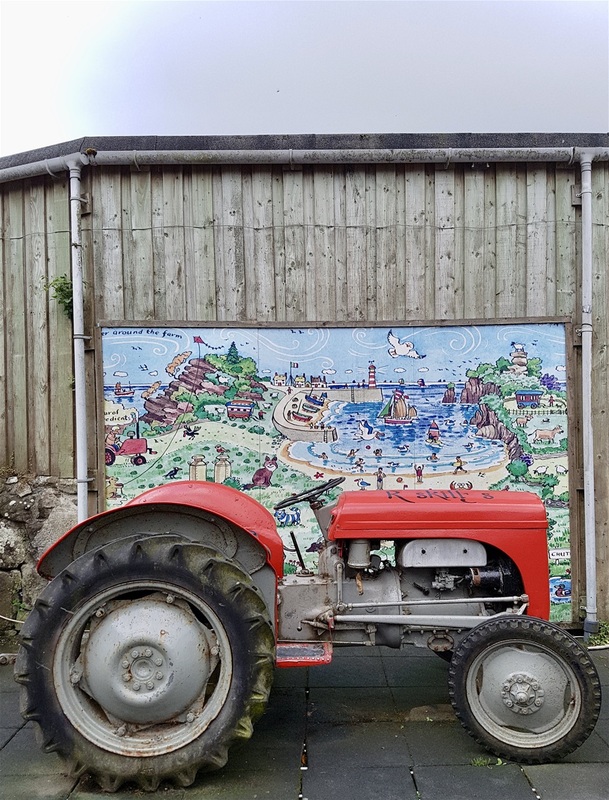 They suggested we left our car here, at no cost as car park ticket machine was out of order, and walk there along the coastal path. It’s not far, they said, so that’s what we did. * That’s not a mis-spelt attempt at agoraphobia; it’s an entirely different phobia. 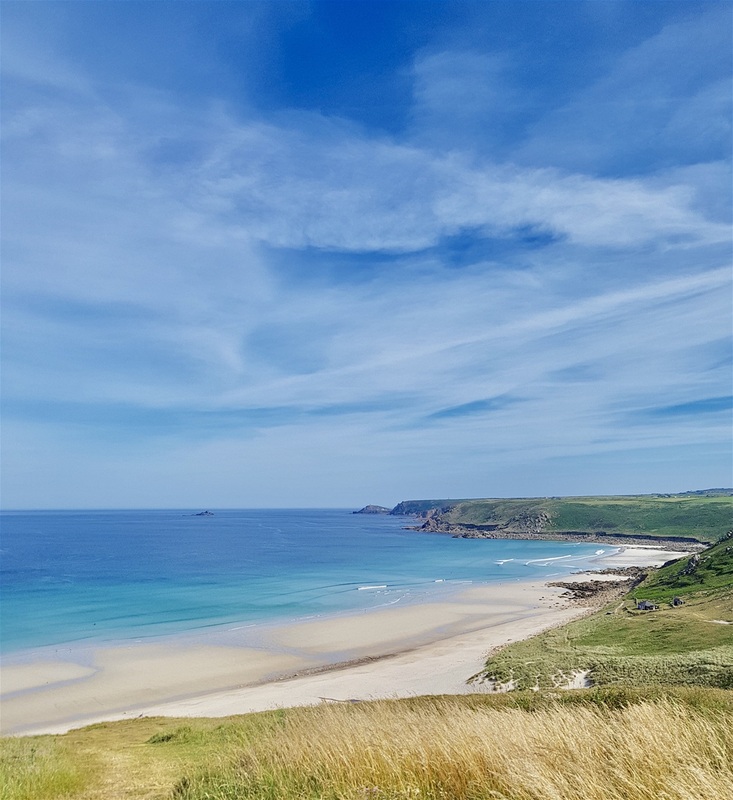 When we finally reached Kynance Cove, by now reduced to a weary ‘trudge,’ it was as glorious as we remembered from previous visits. Oddly, we don’t remember the actual trek to reach the beach being so arduous on previous visits. 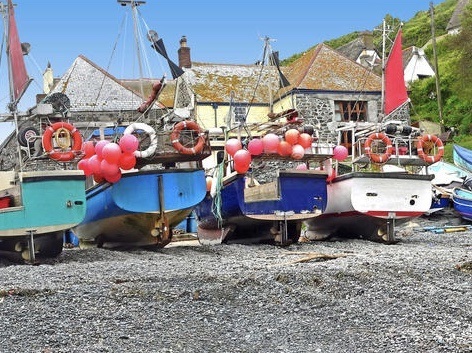 The idea of ourselves having declined physically being so ludicrous as to be discounted we were forced to conclude that coastal erosion was responsible for the vastly increased level of difficulty. ‘That wasn’t too bad, really,’ Marigold said after we’d recovered, a little. Of course we coped magnificently, even overtaking a few ‘proper’ walkers at one point. In fairness, they were carrying the equivalent of a sofa on their backs! Is it really necessary to carry so much ‘stuff’ in a vast rucksack? Marigold pointed out one lad carrying all his worldly goods, plus a guitar, up the hill. Not that it seemed to bother him. ‘You should tell him’’ I replied. ‘Only five miles then, there and back’ I said. Marigold looked aghast. ‘I thought we’d walked about twenty miles,’ she said. 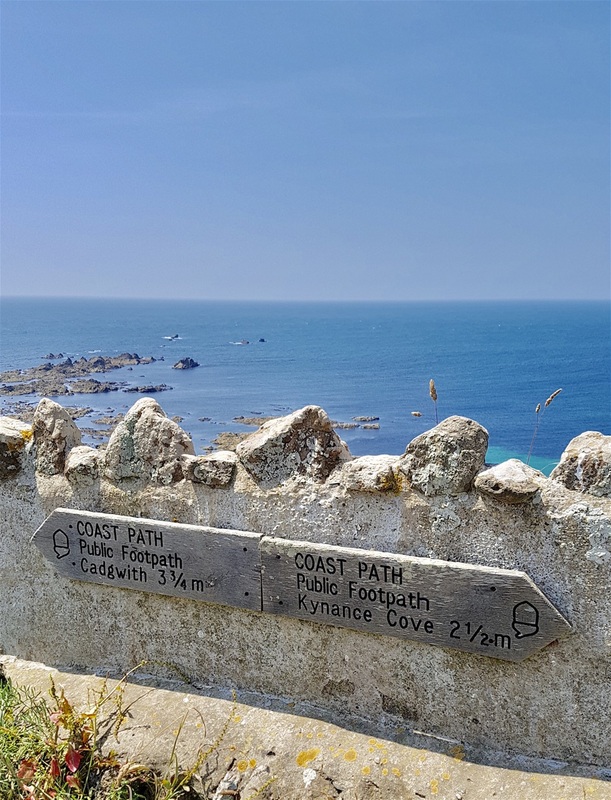 The sign helpfully told us it was a mere three and three quarter miles, each way, if we took the coastal path in the opposite direction. Or we could go there in the car. 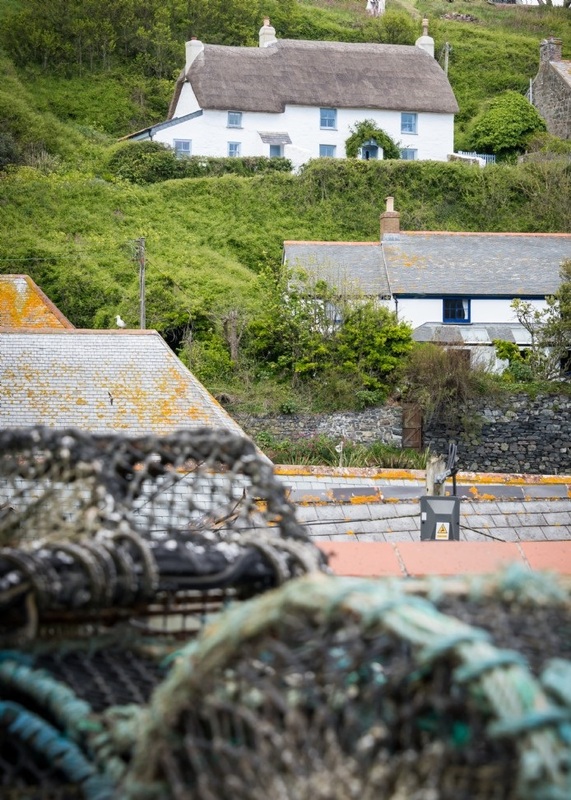 We moved on to Cadgwith Cove, a pretty fishing village with a pub and not much else. 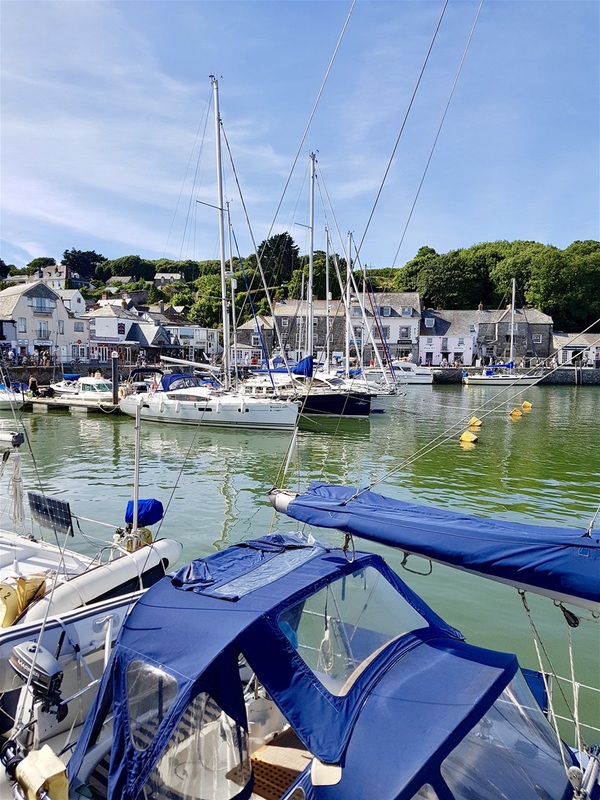 About twelve years ago we came here over Christmas and the New Year, rented a cottage right on the harbour and we haven’t been back since. Not that we didn’t have a good time, far from it, but there’s so much more of the world out there to see! 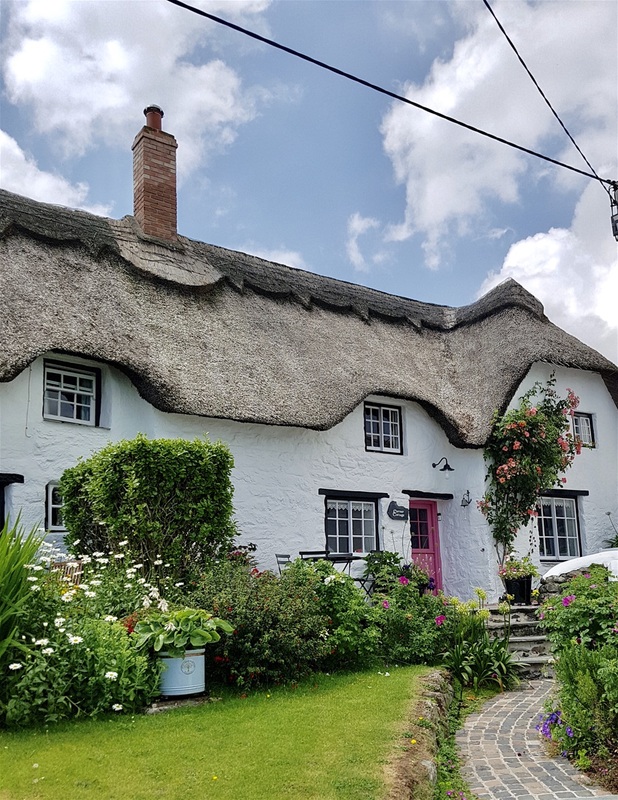 ‘Our’ cottage wasn’t very comfortable, as I recall, the bedroom was dark, dingy and a bit damp in the depths of winter, there was no tv, the oven didn’t work, you get the picture? Christmas dinner, ingredients sourced from far, far away Marks and Spencer in Hayle, was a disaster, but when the tide came in, sea spray battered the windows, the surf pounded on the rocks and it was glorious. The whole village turned out to swim in the sea, in fancy dress, they suspended a galleon, decked out in coloured light, from one side of the harbour to the other to resemble a brightly coloured ship on the horizon and we still talk about the characters in the pub where dogs wandered around freely and a group of fishermen gave an impromptu recital of sea shanties. We missed out on food, but enjoyed Christmas immensely. Today, it’s more or less as we remember. 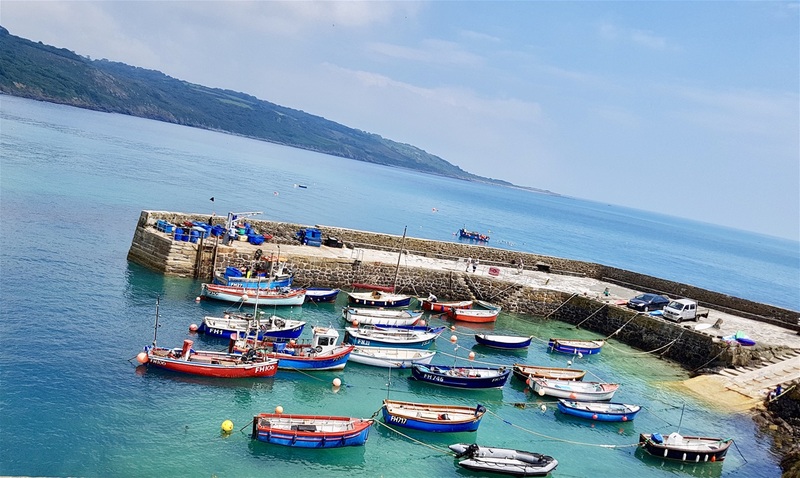 There are a few more houses, almost certainly holiday homes, on the hillside and the fishing boats are drawn up on the beach. Not much to do here if you’re young, I imagine, but we’re not so we didn’t mind. 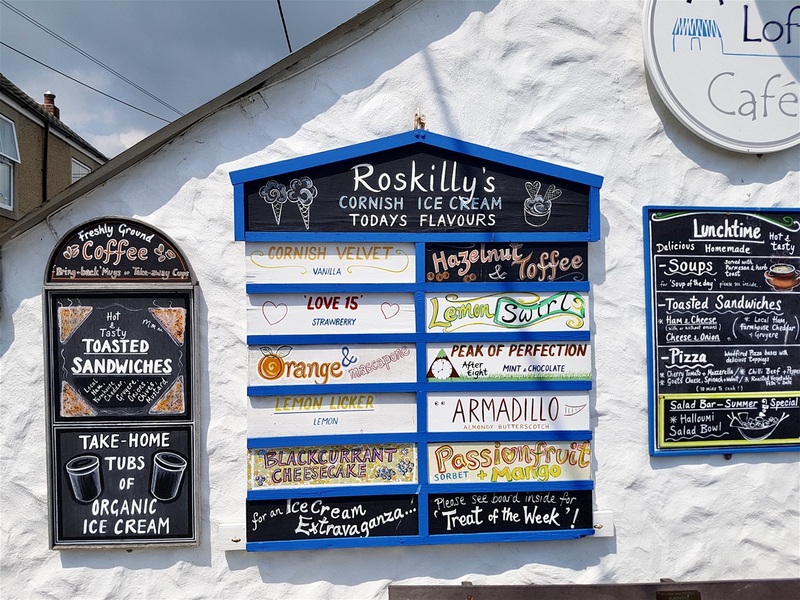 We drove up the far side of the cove, somehow managed to get lost and, completely by accident came across Roskilly Farm where they make cheese, ice cream and many other delicacies. 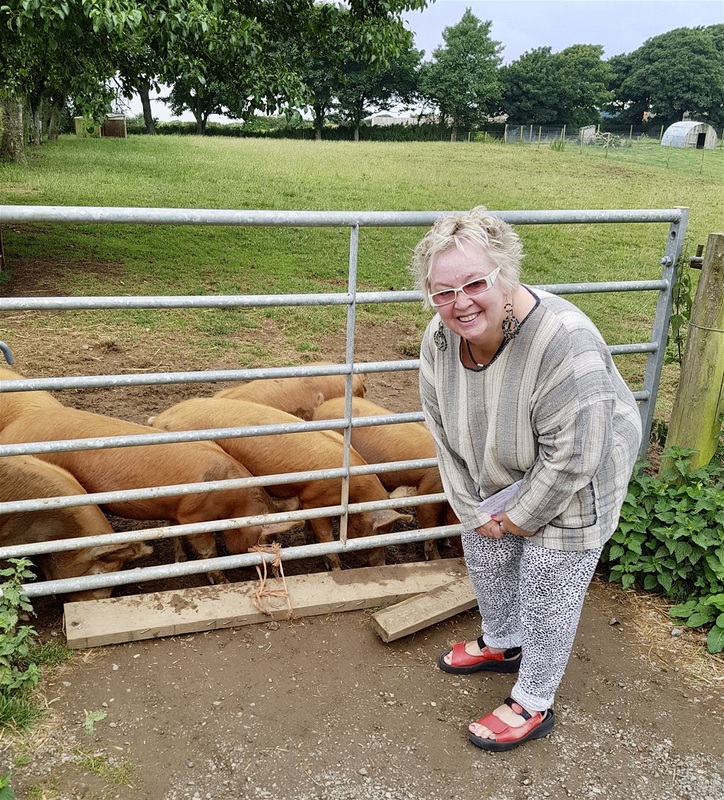 We parked up and were admiring a group of piglets, grubbing about in a field, when two old women turned up. ‘Two mad old biddies’ was Marigold’s version. One said to the piglets, ‘Guess what? I just had a bacon sandwich’ and cackled energetically. Very energetically, which was pretty remarkable considering it was her 80th birthday today. 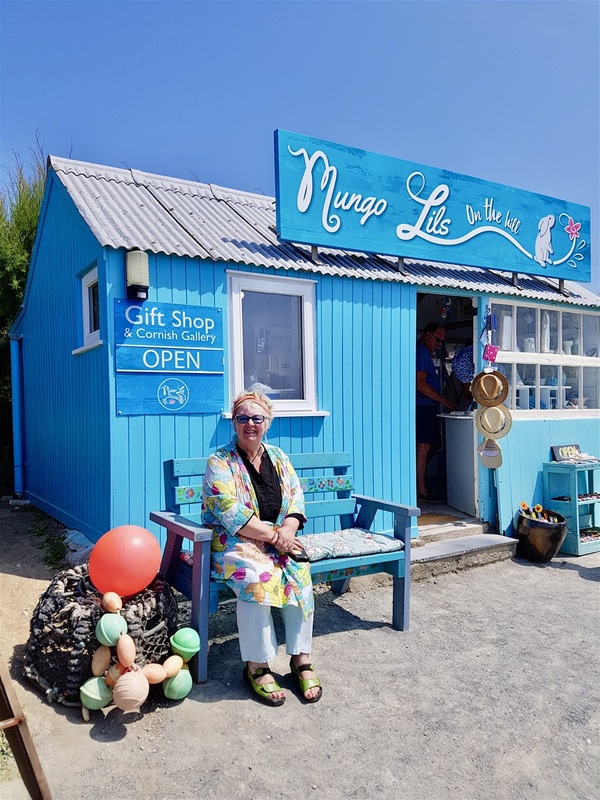 She told us her name was Maud and her friend, aged 83, was Ursula. Perfectly suited names. 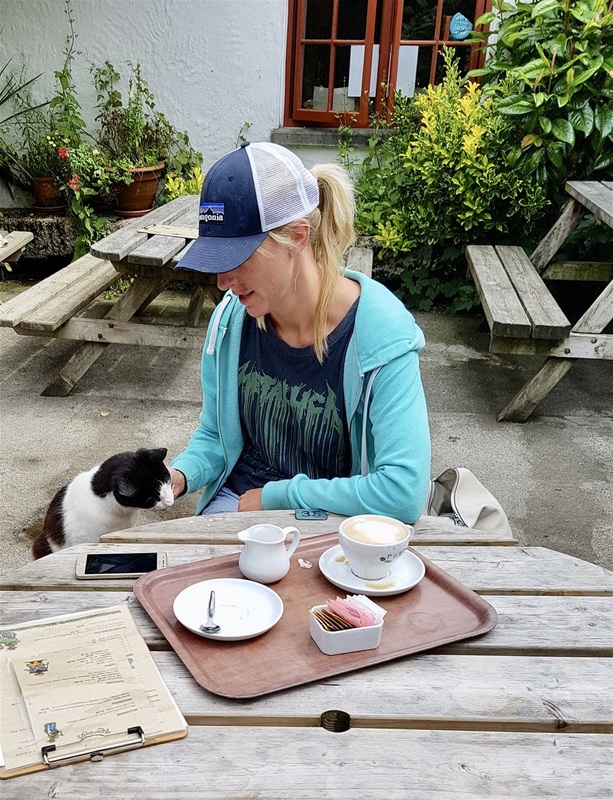 ‘If you go in the café, over there,’ Flora advised, ‘watch out for the cat, he’ll have your arm off if you don’t give him any milk.’ She cackled wildly, again. It was relatively early in the day or I’d have suspected Maud and Ursula had been imbibing freely. Maybe they brought their own supplies. 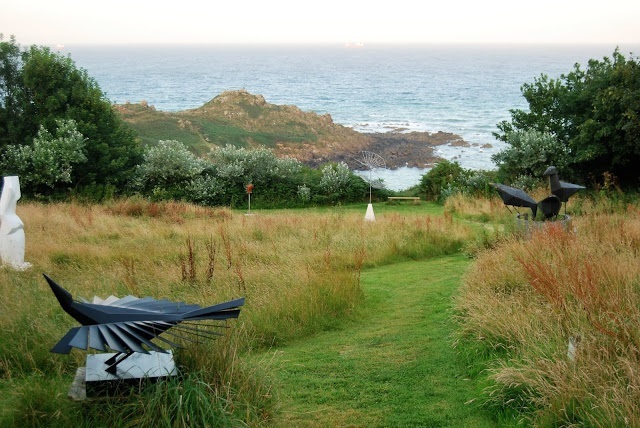 Marigold asked Maud if she knew where to find the sculpture park above Coverack, our next destination. They wandered off and we decided we’d risk the café, despite the grave expressions of concern about potentially lethal cats. 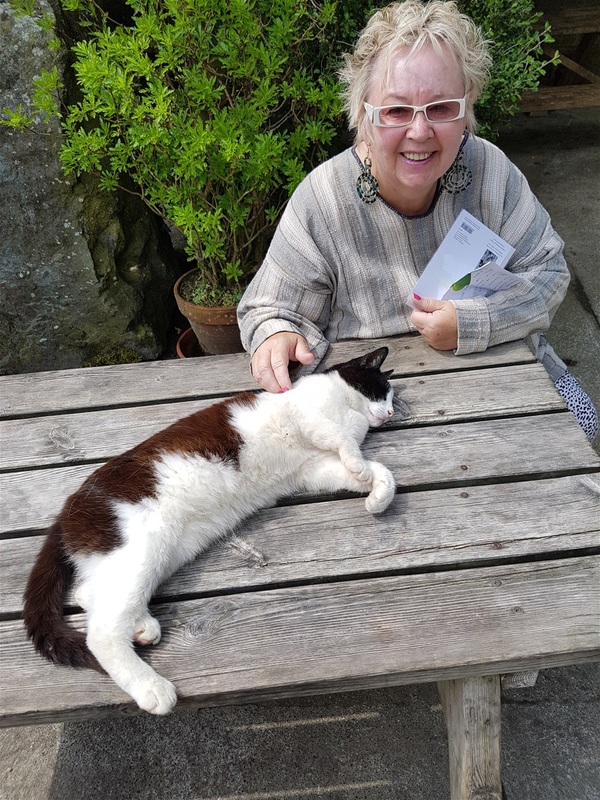 We spotted the killer feline straight away and, as Maud had warned, he was perched on a table in the courtyard, sipping milk from a spoon offered by a customer. He looked too fat to be dangerous and so it proved. When we sat down for a moment, one of those stone in shoe problems, he waddled over, jumped up and began purring. We had no milk on offer, let alone cream, but he allowed us to live a little longer! 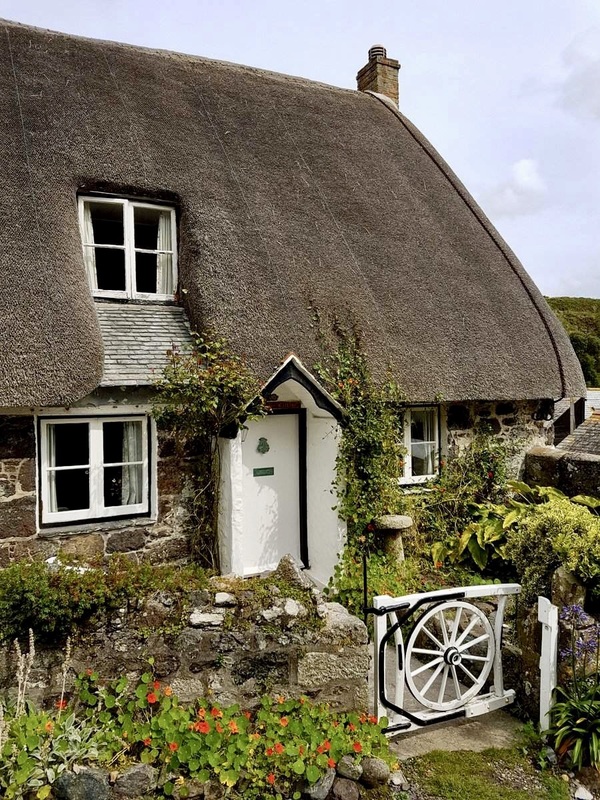 We moved on again to Coverack, A place we’ve been before and we actually stayed briefly in a cottage here a few years ago. We noted the Paris Hotel, set back from the road, on our way in. 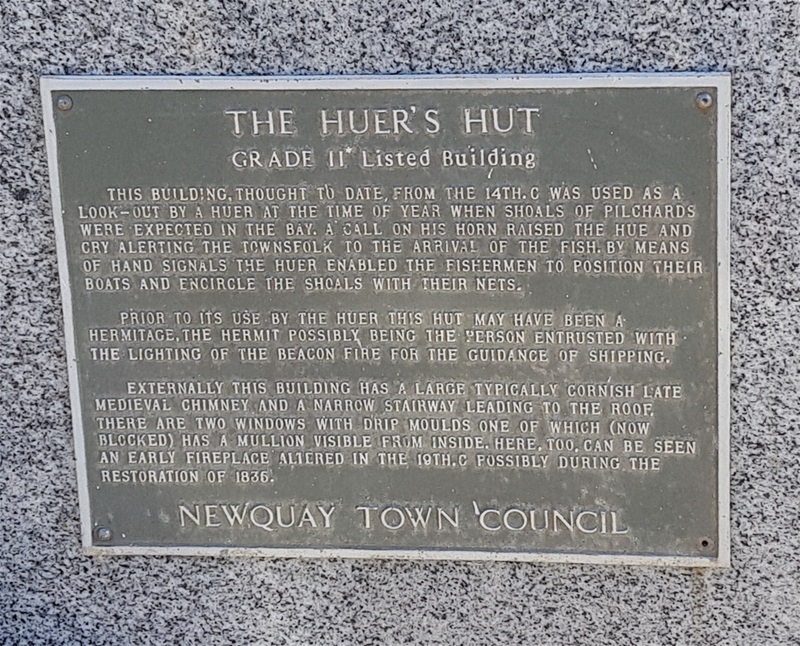 We didn’t bother to go in and ask for directions, but we did discover it was built by the Redruth Brewery in 1907 and named after the liner SS PARIS which ran aground on the headland on Whit Monday 1899. 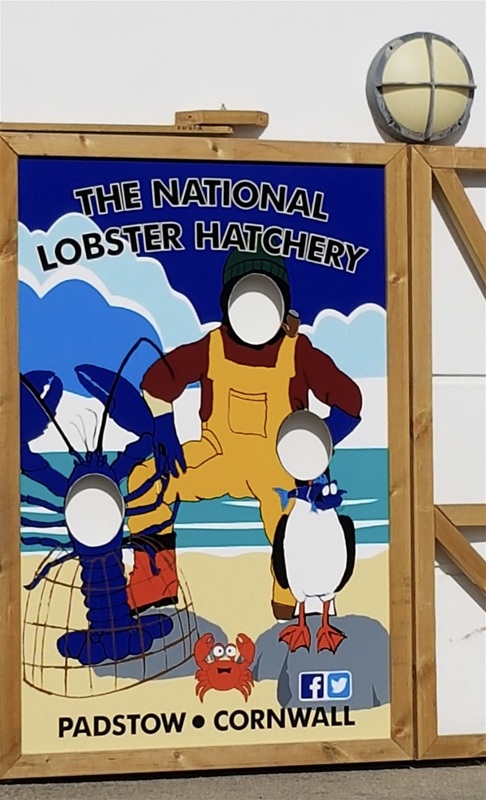 So, the mad old biddies were right, no direct connection to France. Marigold said she remembered a café on the right hand side from our previous visit, but the only one we found was the Harbour Lights café, which wasn’t so familiar. 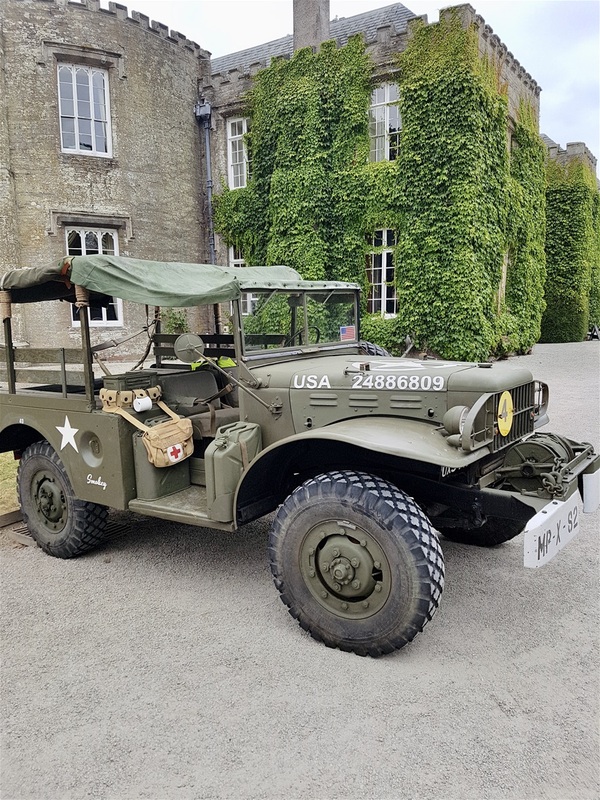 It was waitress service, we were advised, and sat down and watched cars trying, in vain, to find a parking space. It appeared we had taken the last free space! After ten minutes, no one had arrived to take an order so Marigold went inside. The waitress was talking to her friend, laughing like a drain as Marigold put it, and showing no inclination to attend to her VIP customers. 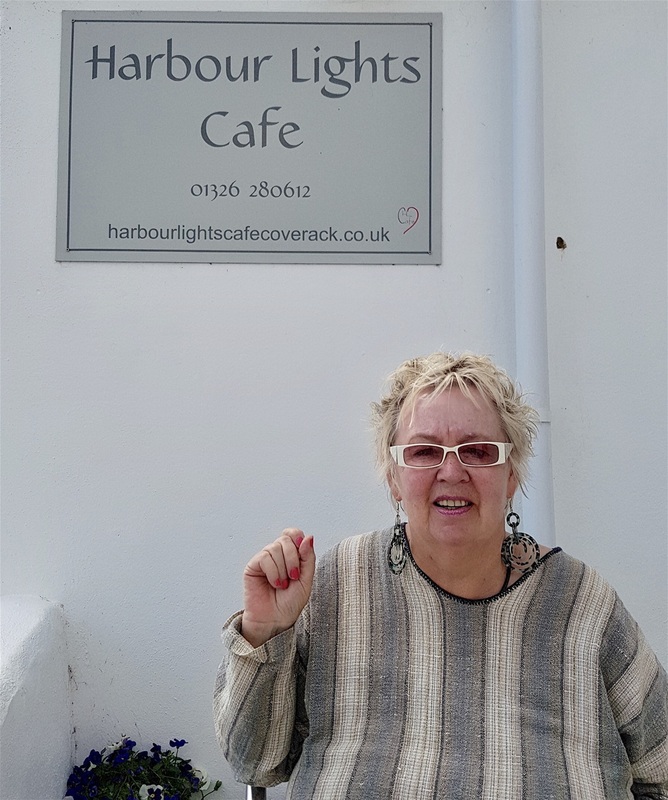 We left the car in its treasured parking space and walked on towards the harbour where we found the café we remembered from last time which also serves as a shop for locals. This isn’t a ‘beach’ resort, there’s very little actual beach, but it’s a pretty village with a great deal of charm. 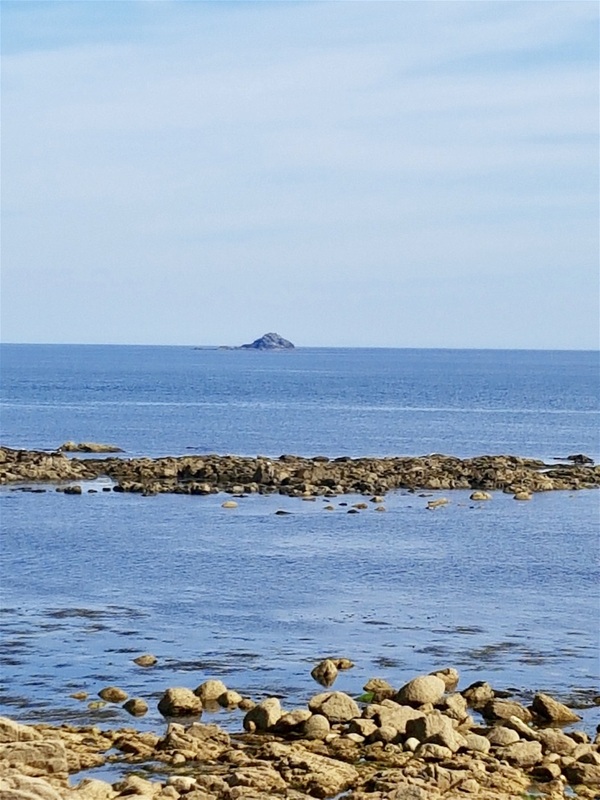 Back to the rocks; a geologist would doubtless offer up a sesquipedalian account of their origin, but I’ll try and keep it brief. 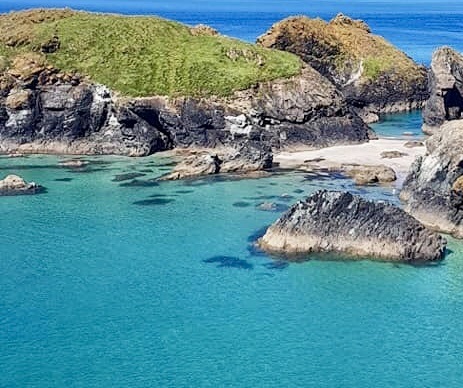 At the bottom of an ancient sea known as the Rheic Ocean, about 375 million years ago, the molten rock which would become the Lizard Peninsula of Cornwall was forced through the Earth's crust from about six miles below. The enormous pressure of these eruptions brought up a complete slice of all the rocks on the way up, from the mantle to the crust. Rocks on this beach originate from the molten magna of the Earth’s core, including the brightly coloured Serpentine rock unique to this area, the actual Earth’s crust, and, even more rarely, rocks formed from the molten junction of the mantle and the core. This transitional section of the Earth’s core is called a fossil Moho, the shortened version of Mohorovicic Discontinuity, normally found five miles or so beneath the ocean bed. 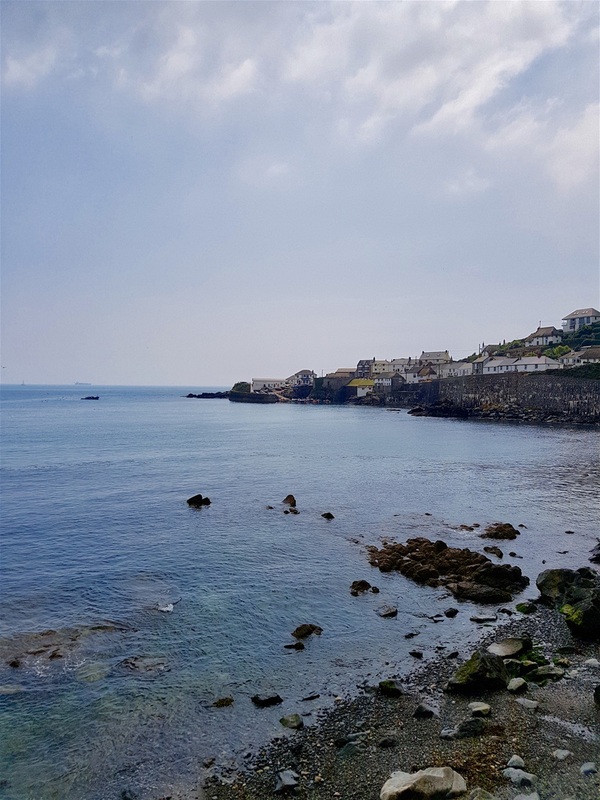 Coverack is one of the few places in the world where it is seen at the Earth’s surface. Enough science, time for some culture. 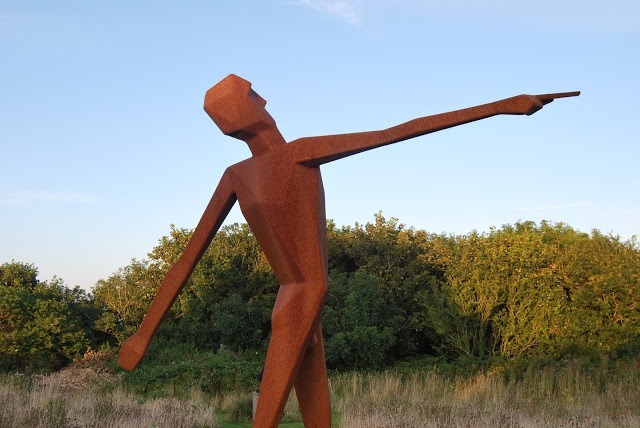 We set off to walk to the Terence Coventry sculpture park as Marigold had seen a reference to it in the Sunday Times. The article didn’t tell us the only way to get there was up a steep hill from the harbour. 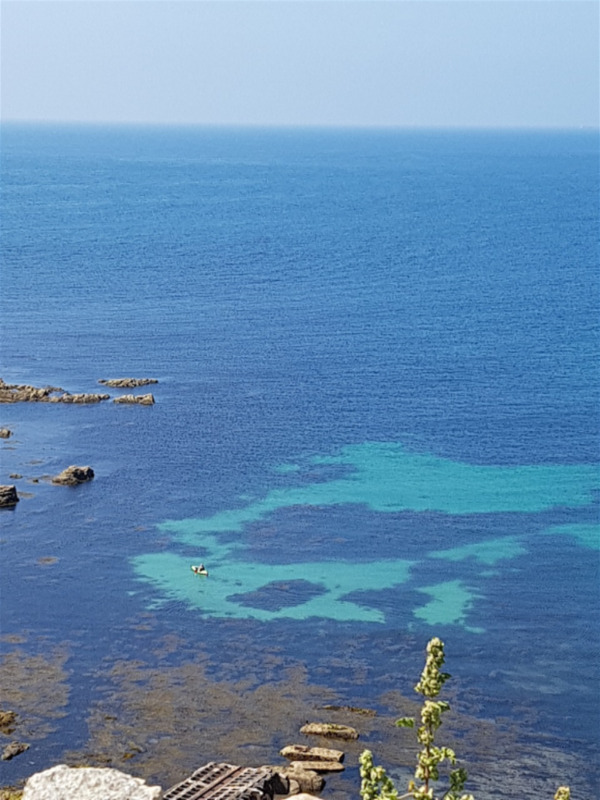 We struggled up the hill, wearing shoes not designed for fell walking, stopping every few minutes to take in the coastal views. Otherwise known as getting our breath back. 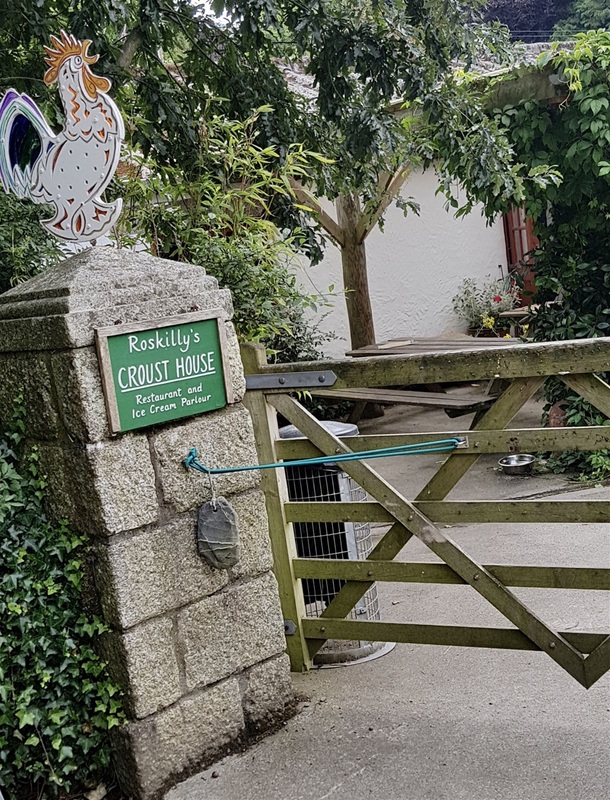 We passed a house on the left bearing a tablet in honour of Elizabeth Coad, who turned out to be a member of the ubiquitous Roskilly family whose wares we’d seen at the family farm. 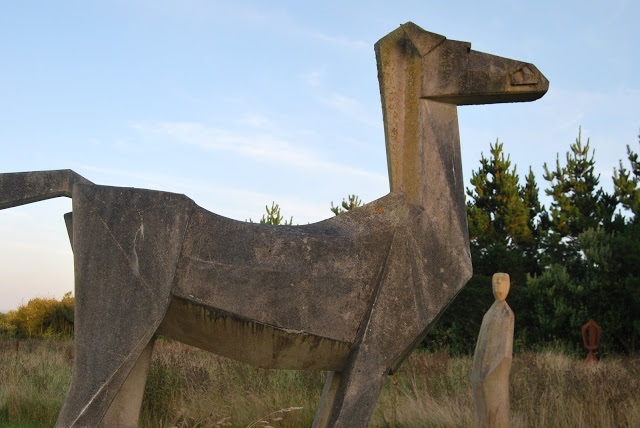 Eventually , we reached the sculptures, in two fields, one to the left and one to the right of the path. 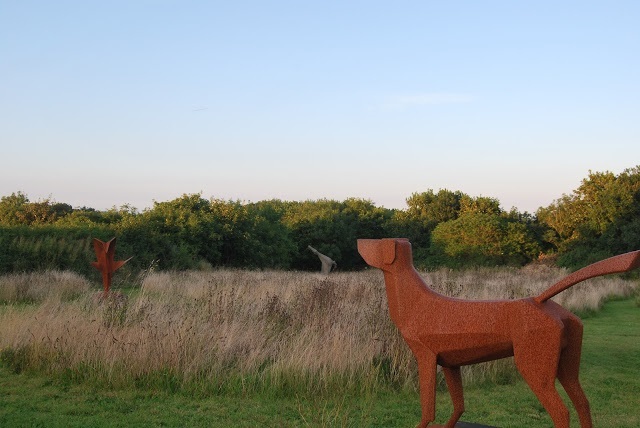 The setting is spectacular and Marigold loved the sculptures.